Most of human knowledge is encoded in natural language. A longstanding goal of artificial intelligence has been to automate the understanding of natural language. Formulating an appropriate representation for the meaning of language has proved problematic. Approaches that employ complex semantic representations, like first order predicate logic, are difficult or impossible to scale to cover the broad range of expressions used in real language. I approach natural language understanding using pairs of English phrases as the basic unit of representation, and automatically labeling them with a small number of semantic relationships that allows a subset of automated reasoning to be applied. This design decision allows us to scale to open domains and to implement data-driven algorithms for acquiring semantic knowledge about language. My approach to language understanding is inspired by my past research in machine translation. The advent of data-driven, statistical models has resulted in dramatically improved quality for machine translation. Commercial systems like Google Translate, or state-of-the-art research software that I have helped develop (the Moses system (Koehn et al, 2007) and the Joshua decoder (Li et al, 2009, Li et al, 2010, Weese et al, 2011, Ganitkevitch et al, 2012, Post et al, 2013)) use pairs of English and foreign phrases as their underlying representation. These phrase pairs are automatically acquired from a large volume of translated documents, and are treated as meaning-equivalent without having an explicit semantic representation. Vast quantities of bilingual training data allow us to extract a huge number of phrase pairs and to estimate associated probabilities. 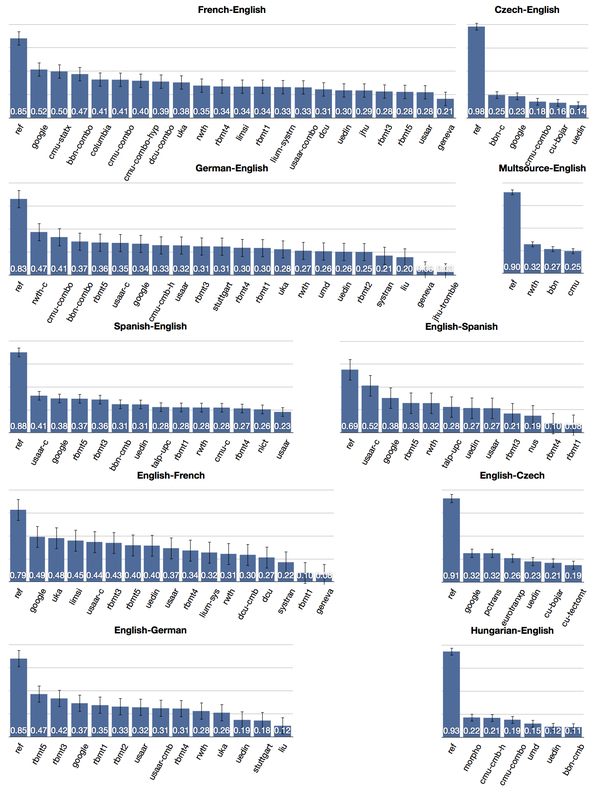 I assembled the largest publicly available bilingual training data for statistical machine translation, consisting of 22 million sentence pairs with 1.5 billion French + English words (Callison-Burch et al, 2009). This encompasses a huge range of language use from scientific abstracts to movie dialog slang, and thus allows the system to translate a wide variety of input sentences. 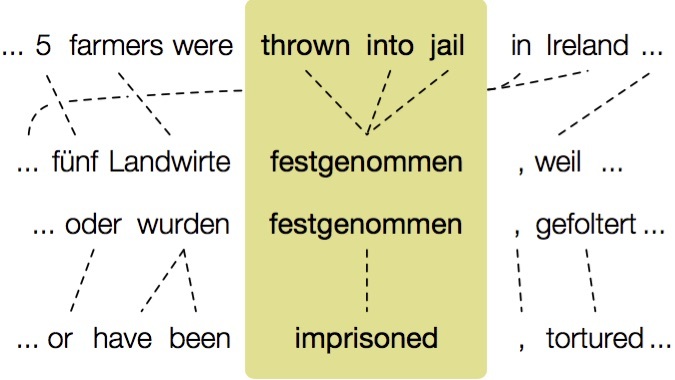 Figure 1: The German festgenommen links the English phrase thrown into jail to its paraphrase imprisoned. I developed a method that extracts paraphrases from bilingual parallel corpora by identifying equivalent English expressions using a shared foreign phrase. This ensures that their meaning is similar. Figure 1 illustrates the method (Bannard and Callison-Burch (2005), Callison-Burch (2007)). Thrown into jail occurs many times in the training data, aligning with several different foreign phrases. Each of these may align with a variety of other English paraphrases. Thus, thrown into jail not only paraphrases as imprisoned, but also as arrested, detained, incarcerated, jailed, locked up, taken into custody, and thrown into prison. However, not all the paraphrases are uniformly good. The baseline method also extracts candidate paraphrases that mean the same thing, but do not share the same syntactic category as the original phrase, such as be thrown in prison, been thrown into jail, being arrested, in jail, in prison, put in prison for, were thrown into jail, and who are held in detention. It is also prone to generating many bad paraphrases, such as maltreated, thrown, cases, custody, arrest, owners, and protection, because of noisy/inaccurate word alignments and other problems. Separating good paraphrases from bad presents fascinating research challenges (Pavlick et al (2015)). Figure 2: We learn the English possessive rule by pivoting over SCFG translation rules. I have extended the bilingual pivoting methodology to syntactic representations of translation rules. This builds on my research group’s work into adding syntactic information into statistical machine translation rules. We have adopted a synchronous context free grammar (SCFG) representation for our Joshua decoder, and we demonstrated that it is useful for translating between languages with different word orders like Urdu’s subject-object-verb order and English’s subject-verb-object order (Baker et al (2010)). 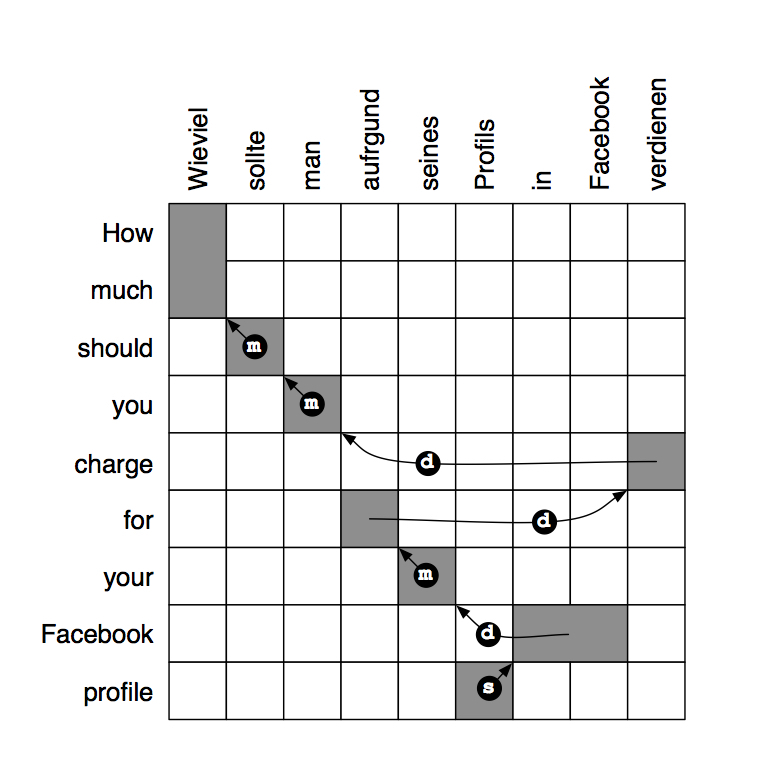 Instead of pivoting over foreign phrases, we can pivot over foreign SCFG rules, as shown in Figure 2. This allows us to automatically acquire meaning-preserving syntactic transformations like the English possessive rule. This rule is a general transformation that can apply to most noun phrases in English. It allows us to recognize that the laptop’s screen can be rewritten as the screen of the laptop. Table 1 shows a variety of other meaning-preserving structural transformations that we learn in this way (Ganitkevitch et al (2011)). Table 1: We are able to automatically acquire a variety of meaning-preserving structural translations in English by pivoting over SCFG translation rules. We used my bilingual pivoting technique to create the paraphrase database, called PPDB for short (Ganitkevitch et al, 2013). PPDB contains 8 million synonyms, 68 million phrasal paraphrases, and 94 million meaning-preserving syntactic transformations. PPDB is freely available from our web site paraphrase.org. It is a much larger resource than the manually-constructed WordNet resource that is heavily used in NLP research. PPDB has made immediate impact and was widely adopted by other researchers. It has been cited 185 times in the three years since its publication, and it was central to the research described in the NAACL 2015 best paper (Faruqui et al, 2015) on retrofitting word vectors to semantic lexicons. The NAACL paper shows that PPDB has enormous potential for improving deep learning of word embeddings. I plan to explore this connection further. Table 2: Examples of different types of entailment relations appearing in PPDB. Semantics: In Pavlick et al (2015), we add an interpretable semantics to PPDB. The relationship between the phrase pairs in the database had been defined as approximately equivalent. Our new research allows these pairs to be encoded with more nuanced semantic relations, including directed entailment (little girl/girl) and exclusion (nobody/someone). We automatically assign semantic entailment relations to all 100 million entries in PPDB using features derived from past work on discovering inference rules from text and semantic taxonomy induction. Examples are given in Table 2. 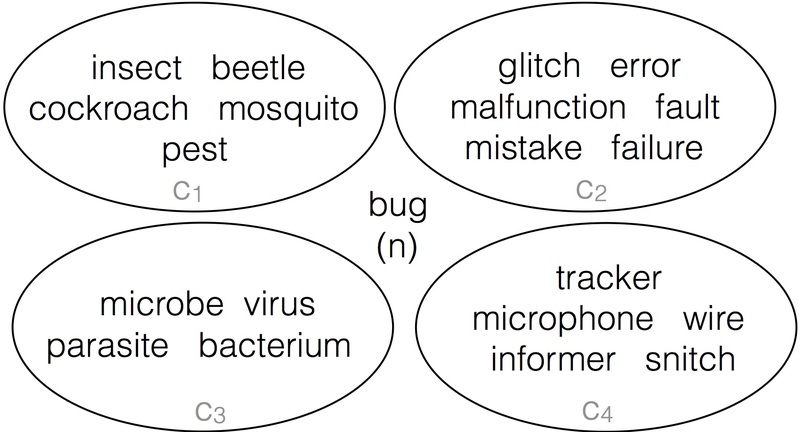 Figure 3: We partition paraphrases of an input word like bug into clusters representing its distinct senses. 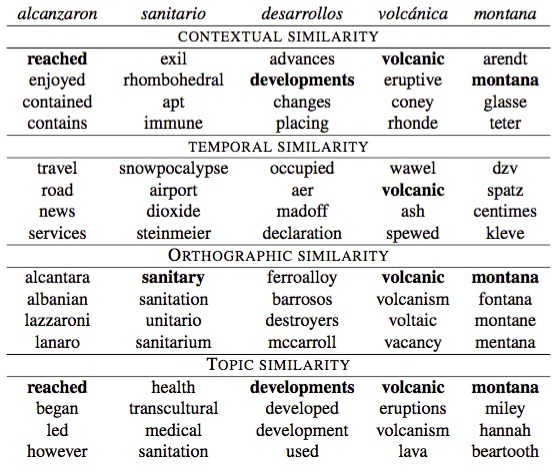 Domain adaptation: Language is used differently in different domains. In Pavlick et al (2015) we demonstrate an algorithm that is able to automatically adapt paraphrases to suit a particular domain. For instance, paraphrase of the word divide when used in biology should include division, break, split, dispense, multiply, cleave, fracture, separate, mitotic division, partition since it refers to cellular division/multiplication. In a parliamentary domain it more commonly refers to the divide between rich and poor, and should be paraphrased as gap, division, gulf, separate, distinction, rift, difference. Natural language generation: Paraphrases are useful in the generation components of dialog systems like Apple’s Siri, question answering, and automatic summarization. We are investigating using paraphrases for text to text generation. Given an input text, rewrite it subject to constraints: for summarization make it shorter; for simplification use words that are easier to understand; for poetry generation conform to a meter and a rhyming scheme. In Xu et al (2015) and Xu et al (2016), we show how paraphrasing and machine translation techniques can be used for the problem of text simplification. Word sense clustering: The original release of PPDB grouped all senses of polysemous words together, and did not partition paraphrases into groups like WordNet does with its synsets. 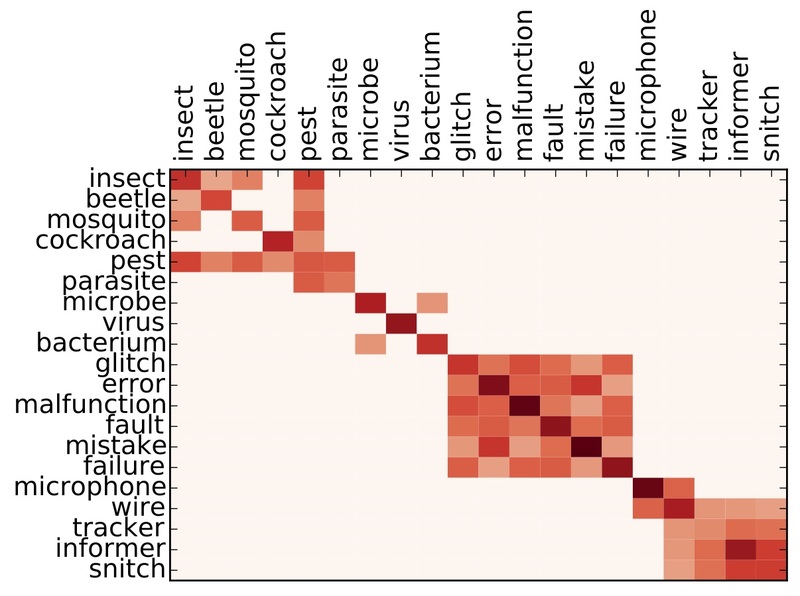 Thus a search for paraphrases of the noun bug would yield a single list of paraphrases that includes insect, glitch, beetle, error, microbe, wire, cockroach, malfunction, microphone, mosquito, virus, tracker, pest, informer, snitch, parasite, bacterium, fault, mistake, failure and many others. In Cocos and Callison-Burch (2016), we systematically explore different clustering algorithms, and ways of defining the similarity matrix that they use as input (Figure 3). We produce high quality sense clusters that represent a substantial improvement to PPDB. We are currently exploring using our sense clusters to perform word sense disambiguation. The goal of the paraphrasing line of my research is to advance the longstanding AI goal of language understanding data-driven methods and statistical models. If successful, it has the potential to impact a wide variety of NLP tasks including information retrieval, question answering, and machine translation. My research into this area has been sponsored by two NSF EAGER awards, multiple grants from the Allen Institute for Artificial Intelligence (AI2) and its predecessor Vulcan, and a $1.6 million DARPA DEFT award. I have submitted an NSF CAREER proposal on this topic. It is currently under review. 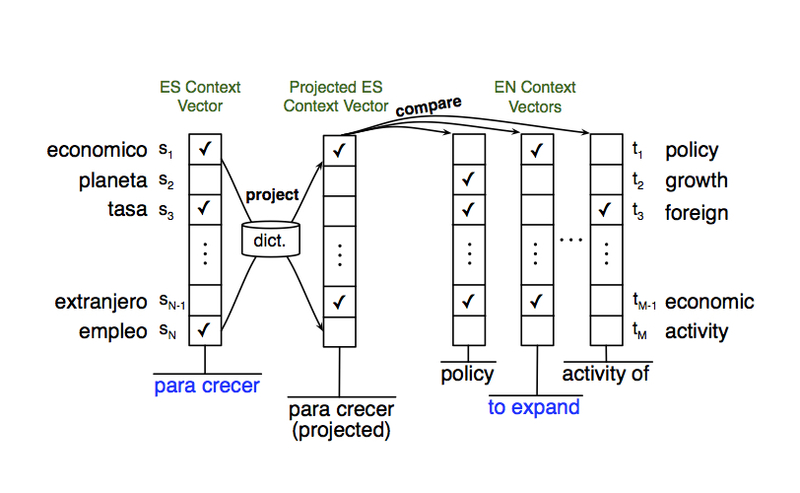 Figure 4: Example of projecting contextual vectors over a seed bilingual lexicon. Statistical machine translation has long been purported to be “language independent” since linguistic information is not typically used when training systems. This has been touted as a strength of the paradigm, because the only requirement for building a new system is a sentence-aligned bilingual parallel corpus. However, this language independence does not mean that statistical machine translation works equally well for every language. Translation quality depends on many factors, including the amount of training data, morphological complexity, and divergences in word order. Since very large parallel corpora are required to achieve good translation quality, statistical machine translation can, in reality, only be applied to a very limited number of languages. My research agenda for the next decade is to transform statistical machine translation so that (1) models can be trained without the use bilingual parallel corpora, (2) linguistic information can be integrated directly into the models and as priors for learning translations and re-ordering patterns, and (3) large groups of Internet users can collaborate to improve translation quality. If successful, these efforts will radically change the field and make statistical machine translation applicable to (nearly) all of the world’s languages. 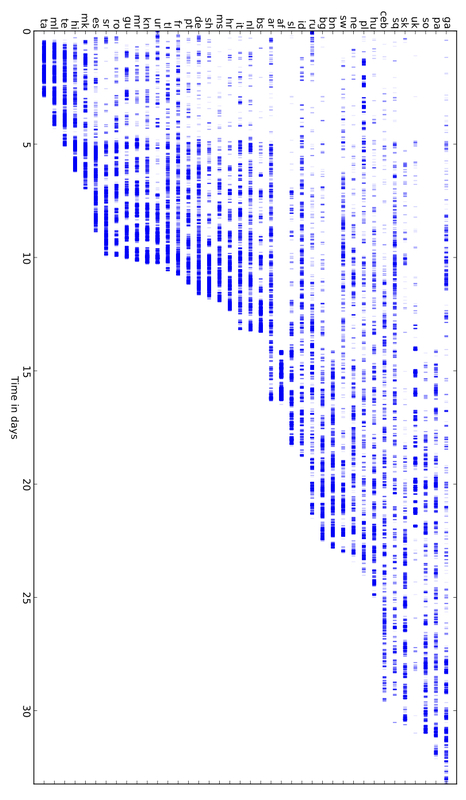 Figure 5: The temporal histograms are collected from monolingual texts spanning several years and show the number of occurrences of each word (on the y-axes) across time. While the correct translation has a good temporal match, the non-translations are less temporally similar. Like other statistical NLP systems and machine learning applications, the performance of statistical machine translation improves as more training data is used. For a few language pairs, we have tremendous amounts of training data – I created a French-English parallel corpus with nearly 1 billion words on each side, the DARPA GALE program produced Arabic-English and Chinese-English parallel corpora with 250 million words in each language, and we have somewhere on the order of 50–100 million words worth of parallel data for the official languages of the European Union. However, for most language pairs, we have comparatively tiny amounts of bilingual training data, which means that current statistical machine translation techniques will not work. To build statistical machine translation systems without parallel corpora, I have revived research started by Rapp (1999), who investigated inducing bilingual lexicons from monolingual texts. 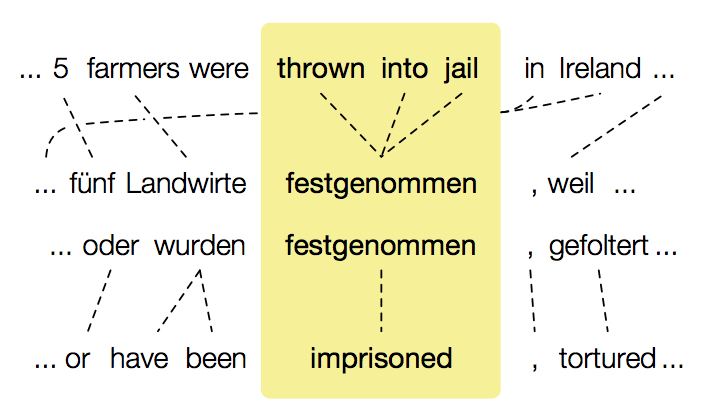 The method uses vector-space semantic models to build a context vector representing words whose translations are unknown. The elements in an unknown word’s vector are projected into the vector space of the other language using the known translations from a small seed bilingual dictionary. This sparse projected vector is compared to the vectors for all words in the target language. The word whose vector is most similar to the projected vector is considered to be the best translation of the unknown word. This process is illustrated in Figure 4. I have successfully replicated the results of Rapp (1999), and used the method to estimate the parameters of phrase-based statistical machine translation systems (Klementiev et al (2012), (Irvine and Callison-Burch (2015)). The advantage of this paradigm is that it only requires a small bilingual dictionary and large monolingual corpora, rather than bilingual parallel data. 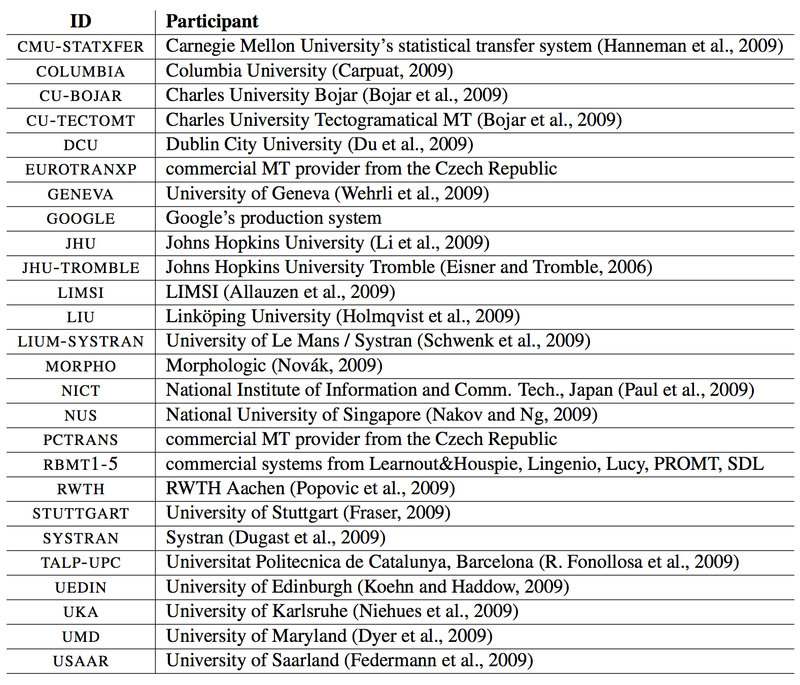 Table 3: Examples of translation candidates ranked using contextual similarity, temporal similarity, orthographic similarity and topic similarity. The correct English translations, when found, are bolded. My group has conducted a study of bilingual lexicon induction on a wide range of languages and data sizes (Irvine and Callison-Burch (accepted)). We examine translation into English from 25 foreign languages: Albanian, Azeri, Bengali, Bosnian, Bulgarian, Cebuano, Gujarati, Hindi, Hungarian, Indonesian, Latvian, Nepali, Romanian, Serbian, Slovak, Somali, Spanish, Swedish, Tamil, Telugu, Turkish, Ukrainian, Uzbek, Vietnamese and Welsh. Rather than testing solely on high frequency words, as previous research has done, we test on low frequency as well, so that our results are more relevant to statistical machine translation, where systems typically lack translations of rare words that fall outside of their training data. We systematically explore a wide range of features and phenomena that affect the quality of the translations discovered by bilingual lexicon induction. We give illustrative examples of the highest ranking translations for orthogonal signals of translation equivalence like contextual similarity and temporal similarity. We analyze the effects of frequency and burstiness, and the sizes of the seed bilingual dictionaries and the monolingual training corpora. Our model performs better than the previous state-of-the-art matching canonical correlation analysis (MCCA) algorithm, achieving an accuracy of 42% versus MCCA’s 15%. My goal is to go beyond simply expanding bilingual dictionaries so that we can use bilingual lexicon induction techniques in order to produce full translations systems. I am extending the model to translations of phrases (instead of just words), to calculate translation probabilities, and to predict word order of translations. My research has been supported by two DARPA grants – a $500k follow-on grant to my participation in the DARPA Computer Science Study Group, and a new $450k multi-year DARPA LORELEI project. My third research focus is crowdsourcing. The idea of using crowdsourcing to create annotated data for natural language processing applications is a relatively new topic, and it raises a number of scientific challenges. Rather than treating annotated training data as a gold standard created by experts whose labels are authoritative, we must cope with the fact that we have anonymous, non-expert annotators whose labels are noisy and who may not even be doing the task conscientiously. We build models of the annotators themselves, and use those models to create high quality labeled training data by soliciting redundant labels and making predictions about which labels and which annotators are most likely to be correct. The ability to accurately model the annotators has direct implications for the cost of creating a labeled training data set, since we can decide how much to trust a given annotator’s label and whether soliciting a redundant label would be likely to improve the accuracy. 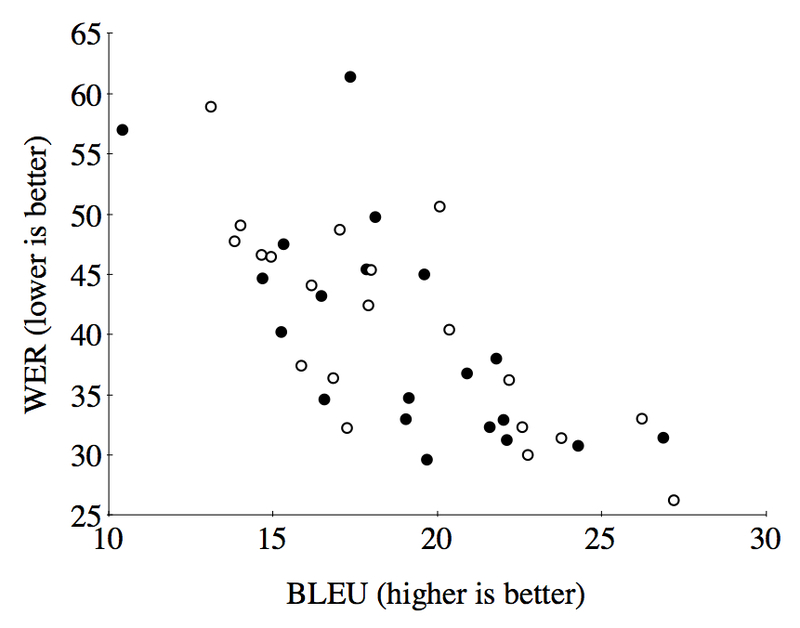 Figure 6: A comparison of the translation quality (approximated by Bleu score) for professionals against different ways of selecting the Turker translations from among 4 redundant translations. 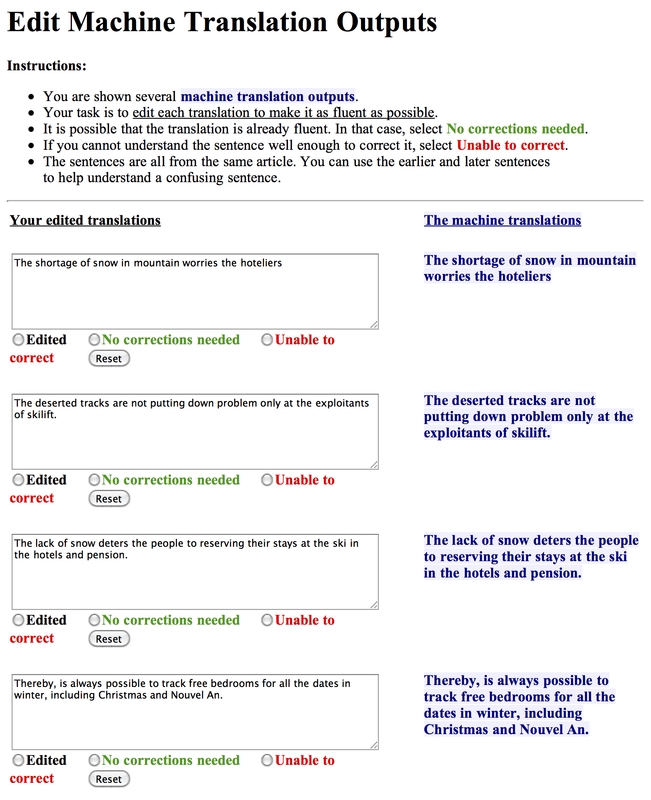 A large scale evaluation of machine translation output by crowd workers with a comprehensive comparison against expert annotators and recommendations for quality control (Callison-Burch et al (2010)). Translations of 1.5 million words worth of Egyptian Arabic and Levine Arabic data. 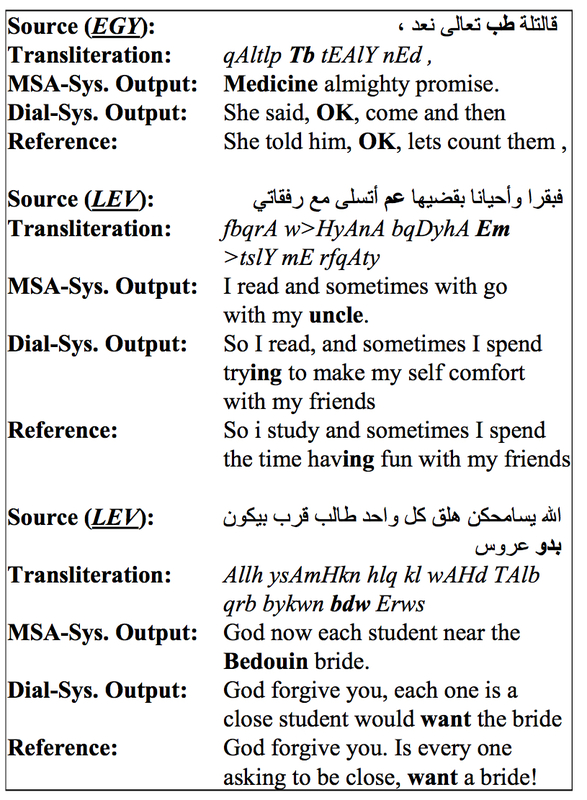 This allowed us to train a statistical machine translation system to translate Arabic dialect that was better than a system trained on 100 times more MSA data (Zbib et al (2012)). Parallel corpora for six Indian languages. 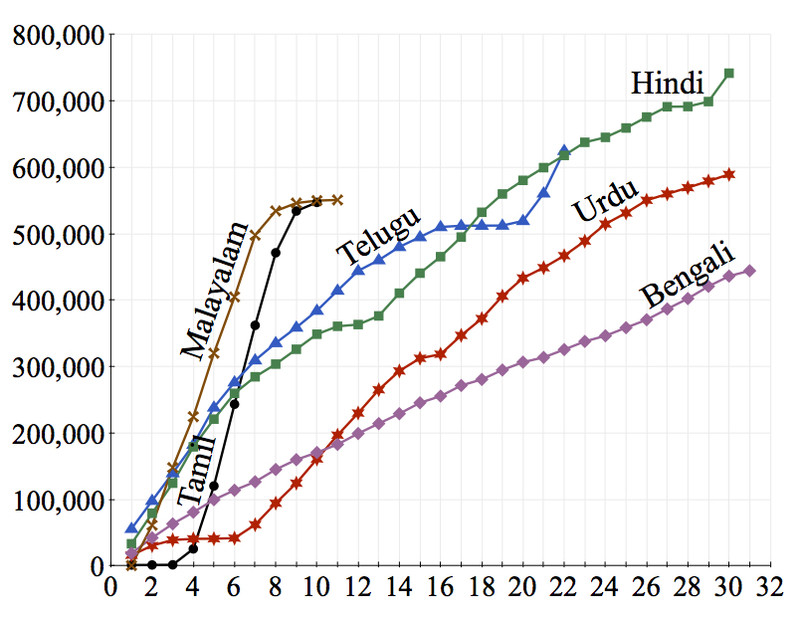 These data sets are valuable for evaluating syntactic models of translations, since Indian languages are verb final and require a lot of long-distance reordering (Post et al (2012)). Translations of 1.8 million words of spoken Spanish and of 143k words of spoke Egyptian Arabic. This data facilitates research into spoken language translation (Kumar et al (2014), Post et al (2013)). 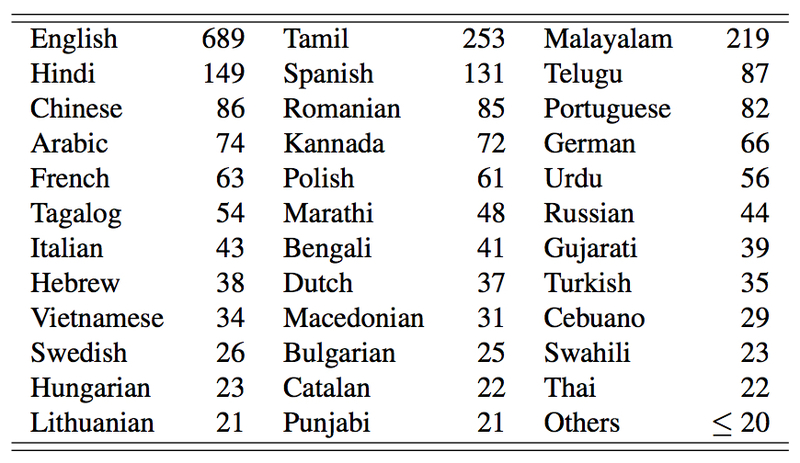 A demographic study of the languages spoken by workers on the Mechanical Turk crowdsourcing platform, which resulted in bilingual dictionaries for 100 languages with 10,000 words translated in each of the languages (Pavlick et al (2014)). My research into crowdsourcing for NLP has been facilitated by a $500,000 DARPA grant, two Google faculty research awards totaling $195,000, and approximately $100,000 towards a Mechanical Turk annotation budget from the Human Language Technology Center of Excellence. I have a new 2 year DARPA LORELEI grant under the LDC for creating data for low resource languages using crowdsourcing. My interests in crowdsourcing have expanded beyond natural language processing. I have designed a semester-long course on Crowdsourcing and Human Computation (described in my teaching statement). I have two research projects related to social justice that use crowdsourcing. In one project, I am designing tools to help crowd workers find better higher paying work (Callison-Burch (2014)) (see crowd-workers.com). In another, I am using crowdsourcing to create a structured database of all shootings in the United States to facilitate public health research (which the Republican congress has blocked the CDC and NIH from doing). See my teaching statement for a description of the gun violence database project (Pavlick and Callison-Burch (2016)). Most recent sentence simplification systems use basic machine translation models to learn lexical and syntactic paraphrases from a manually simplified parallel corpus. These methods are limited by the quality and quantity of manually simplified corpora, which are expensive to build. In this paper, we conduct an in-depth adaptation of statistical machine translation to perform text simplification, taking advantage of large-scale paraphrases learned from bilingual texts and a small amount of manual simplifications with multiple references. Our work is the first to design automatic metrics that are effective for tuning and evaluating simplification systems, which will facilitate iterative development for this task. We use bilingual lexicon induction techniques, which learn translations from monolingual texts in two languages, to build an end-to-end statistical machine translation (SMT) system without the use of any bilingual sentence-aligned parallel corpora. We present detailed analysis of the accuracy of bilingual lexicon induction, and show how a discriminative model can be used to combine various signals of translation equivalence (like contextual similarity, temporal similarity, orthographic similarity and topic similarity). Our discriminative model produces higher accuracy translations than previous bilingual lexicon induction techniques. We reuse these signals of translation equivalence as features on a phrase-based SMT system. These monolingually-estimated features enhance low resource SMT systems in addition to allowing end-to-end machine translation without parallel corpora. Bilingual lexicon induction is the task of inducing word translations from monolingual corpora in two languages. In this paper we present the most comprehensive analysis of bilingual lexicon induction to date. We present experiments on a wide range of languages and data sizes. 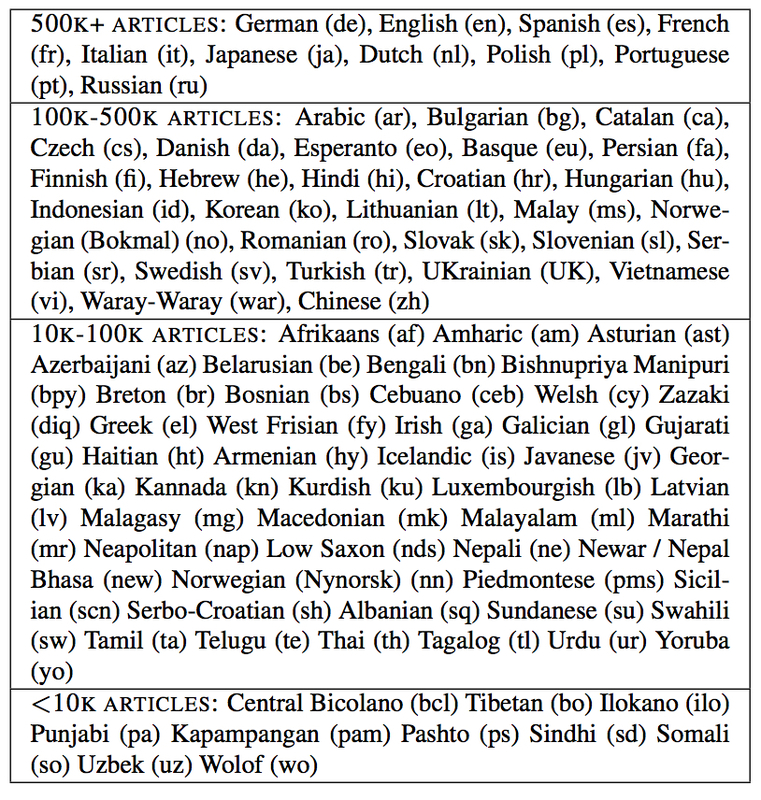 We examine translation into English from 25 foreign languages -- Albanian, Azeri, Bengali, Bosnian, Bulgarian, Cebuano, Gujarati, Hindi, Hungarian, Indonesian, Latvian, Nepali, Romanian, Serbian, Slovak, Somali, Spanish, Swedish, Tamil, Telugu, Turkish, Ukrainian, Uzbek, Vietnamese and Welsh. We analyze the behavior of bilingual lexicon induction on low frequency words, rather than testing solely on high frequency words, as previous research has done. Low frequency words are more relevant to statistical machine translation, where systems typically lack translations of rare words that fall outside of their training data. We systematically explore a wide range of features and phenomena that affect the quality of the translations discovered by bilingual lexicon induction. We give illustrative examples of the highest ranking translations for orthogonal signals of translation equivalence like contextual similarity and temporal similarity. We analyze the effects of frequency and burstiness, and the sizes of the seed bilingual dictionaries and the monolingual training corpora. Additionally, we introduce a novel discriminative approach to bilingual lexicon induction. Our discriminative model is capable of combining a wide variety of features, which individually provide only weak indications of translation equivalence. When feature weights are discriminatively set, these signals produce dramatically higher translation quality than previous approaches that combined signals in an unsupervised fashion (e.g. using minimum reciprocal rank). We also directly compare our model's performance against a sophisticated generative approach, the matching canonical correlation analysis (MCCA) algorithm used by Haghighi et al (2008). Our algorithm achieves an accuracy of 42% versus MCCA's 15%. We argue that NLP researchers are especially well-positioned to contribute to the national discussion about gun violence. Reasoning about the causes and outcomes of gun violence is typically dominated by politics and emotion, and data-driven research on the topic is stymied by a shortage of data and a lack of federal funding. However, data abounds in the form of unstructured text from news articles across the country. This is an ideal application of NLP technologies, such as relation extraction, coreference resolution, and event detection. We introduce a new and growing dataset, the Gun Violence Database, in order to facilitate the adaptation of current NLP technologies to the domain of gun violence, thus enabling better social science research on this important and under-resourced problem. We present a new release of the Paraphrase Database. PPDB 2.0 includes a discriminatively re-ranked set of paraphrases that achieve a higher correlation with human judgments than PPDB 1.0’s heuristic rankings. Each paraphrase pair in the database now also includes fine-grained entailment relations, word embedding similarities, and style annotations. We add an interpretable semantics to the paraphrase database (PPDB). To date, the relationship between the phrase pairs in the database has been weakly defined as approximately equivalent. We show that in fact these pairs represent a variety of relations, including directed entailment (little girl/girl) and exclusion (nobody/someone). We automatically assign semantic entailment relations to entries in PPDB using features derived from past work on discovering inference rules from text and semantic taxonomy induction. We demonstrate that our model assigns these entailment relations with high accuracy. In a downstream RTE task, our labels rival relations from WordNet and improve the coverage of a proof-based RTE system by 17%. Abstract: We add an interpretable semantics to the paraphrase database (PPDB). To date, the relationship between the phrase pairs in the database has been weakly defined as approximately equivalent. We show that in fact these pairs represent a variety of relations, including directed entailment (little girl/girl) and exclusion (nobody/someone). We automatically assign semantic entailment relations to entries in PPDB using features derived from past work on discovering inference rules from text and semantic taxonomy induction. We demonstrate that our model assigns these entailment relations with high accuracy. In a downstream RTE task, our labels rival relations from WordNet and improve the coverage of a proof-based RTE system by 17%. Figure 1: An example sentence pair for the RTE task. 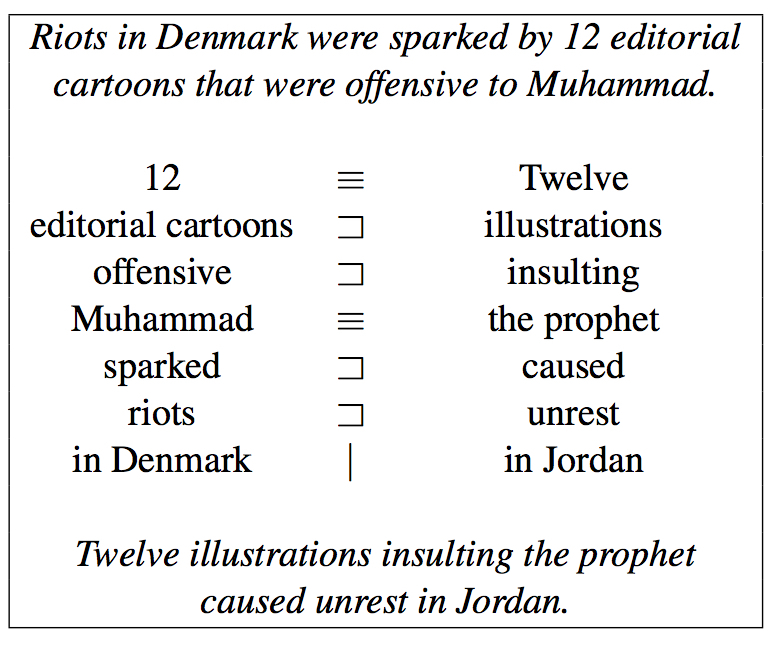 In order for a system to conclude that the premise (top) does not entail the hypothesis (bottom), it should recognize that sparked implies caused but that in Denmark precludes in Jordan. These phrase-level entailment relationships are modeled by natural logic. Table 1: Examples of different types of entailment relations appearing in PPDB. Figure 2: Distribution of entailment relations in different sizes of PPDB. 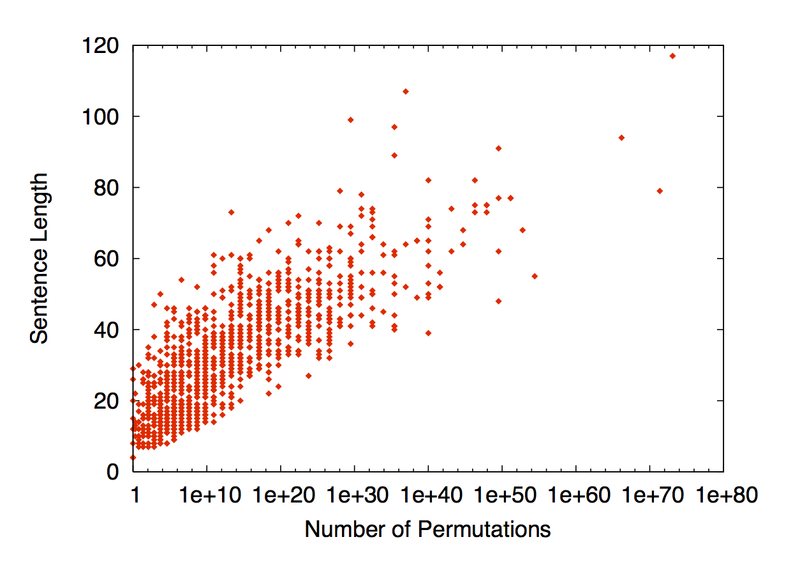 Distributions are estimated from our manual annotations of randomly sampled pairs. PPDB-XXXL contains over 77MM paraphrase pairs (where the majority type is independent), compared to only 700K in PPDB-S (where the majority type is equivalent). 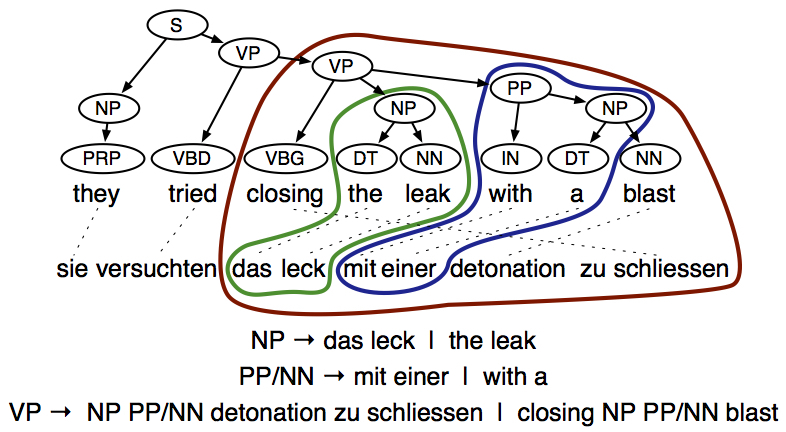 Figure 3: Summary of features extracted for each phrase pair ⟨p1,p2⟩. Full descriptions of the features used are given in the supplementary material. Table 2: Column 1 gives the semantics of each label under MacCartney’s Natural Logic. Column 2 gives the notation we use throughout the remainder of this paper. Column 3 gives the description that was shown to Turkers. Table 3: Top scoring pairs (x/y) according to various similarity measures, along with their manually classified entailment labels. Column 1 is cosine similarity based on dependency contexts. Column 2 is based on Lin (1998), column 3 on Weeds (2004), and column 4 is a novel feature. Precise definitions of each metric are given in the supplementary material. Table 4: Top paths associated with the ¬ class. Table 5: F1 measure (×100) achieved by entailment classifier using 10-fold cross validation on the training data. Figure 4: Confusion matrices for classifier trained using only monolingual features (distributional and path) versus bilingual features (paraphrase and translation). True labels are shown along rows, predicted along columns. The matrix is normalized along rows, so that the predictions for each (true) class sum to 100%. 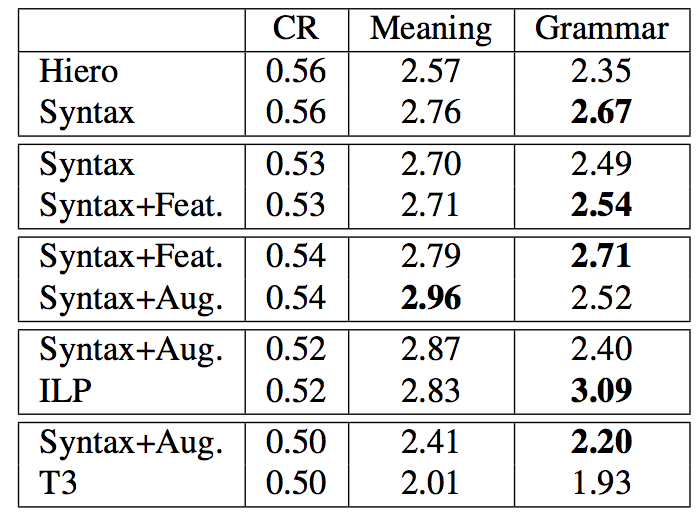 Table 7: F1 measure (×100) achieved by entailment classifier on the held out phrase pairs from the sentences in SICK test. Table 6: Example misclassifications from some of the most frequent and most interesting error categories. Table 8: Nutcracker’s overall system accuracy and proof coverage when using different sources of axioms. Coverage is measured as the percent of sentence pairs for which NC’s theorem prover or model builder is able to find a complete logical proof of either entailment or contradiction. When NC fails to find either type of proof, it guesses the most frequent class, NEUTRAL. NC alone uses no axioms. PPDB+ refers to the axioms generated automatically using the classifier described in this paper. 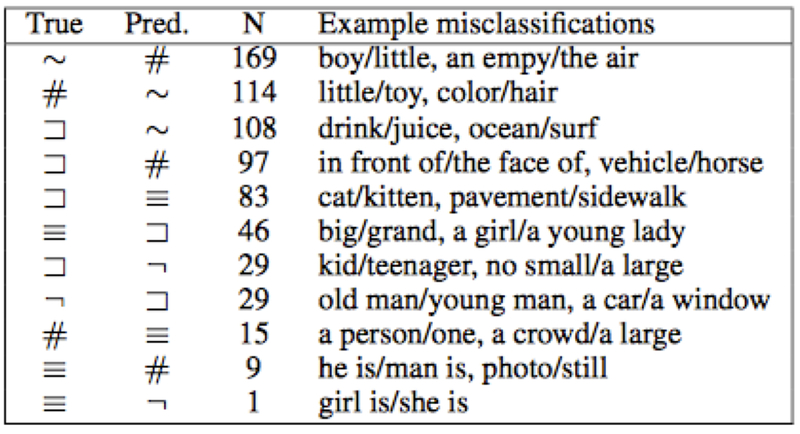 PPDB-H refers axioms generated using the human labels on which the classifier was trained. Table 9: Examples of T/H pairs for which the system’s prediction differed when using PPDB+ vs. WN. The validity of applying paraphrase rules depends on the domain of the text that they are being applied to. We develop a novel method for extracting domain-specific paraphrases. We adapt the bilingual pivoting paraphrase method to bias the training data to be more like our target domain of biology. 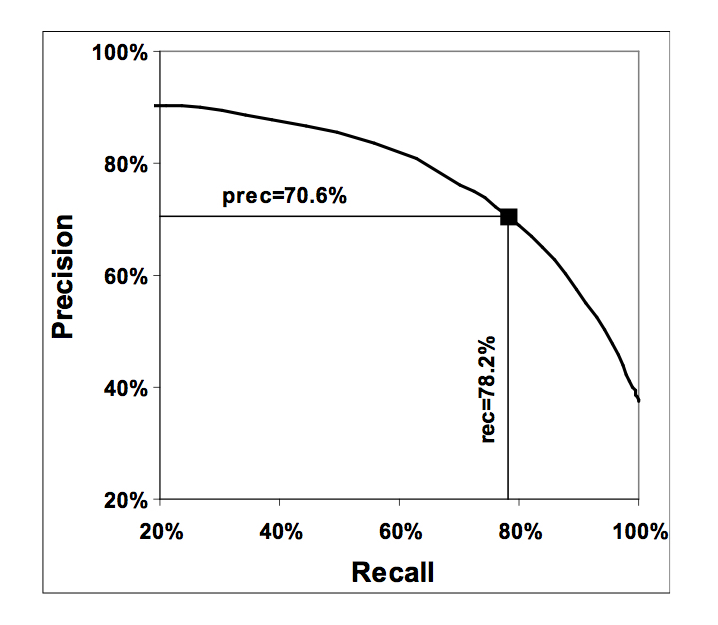 Our best model results in higher precision while retaining complete recall, giving a 10% relative improvement in AUC. Abstract: Simple Wikipedia has dominated simplification research in the past 5 years. In this opinion paper, we argue that focusing on Wikipedia limits simplification research. We back up our arguments with corpus analysis and by highlighting statements that other researchers have made in the simplification literature. We introduce a new simplification dataset that is a significant improvement over Simple Wikipedia, and present a novel quantitative-comparative approach to study the quality of simplification data resources. 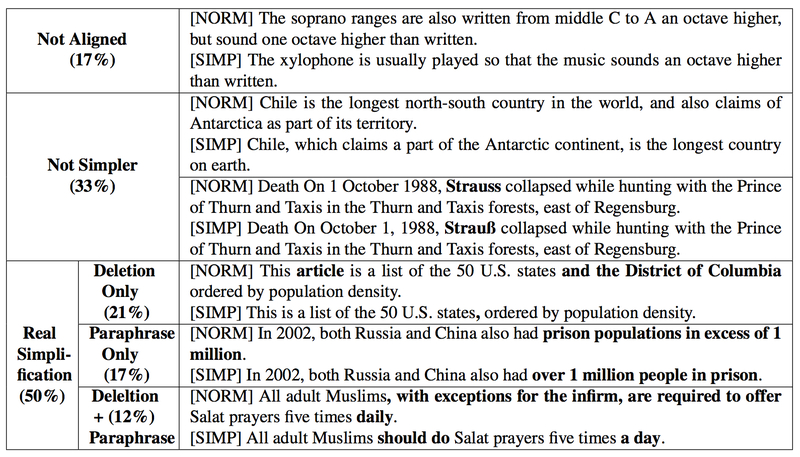 Table 1: Example sentence pairs (NORM-SIMP) aligned between English Wikipedia and Simple English Wikipedia. 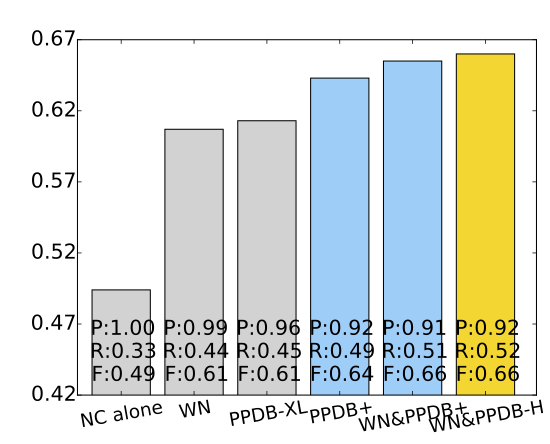 The breakdown in percentages is obtained through manual examination of 200 randomly sampled sentence pairs in the Parallel Wikipedia Simplification (PWKP) corpus. 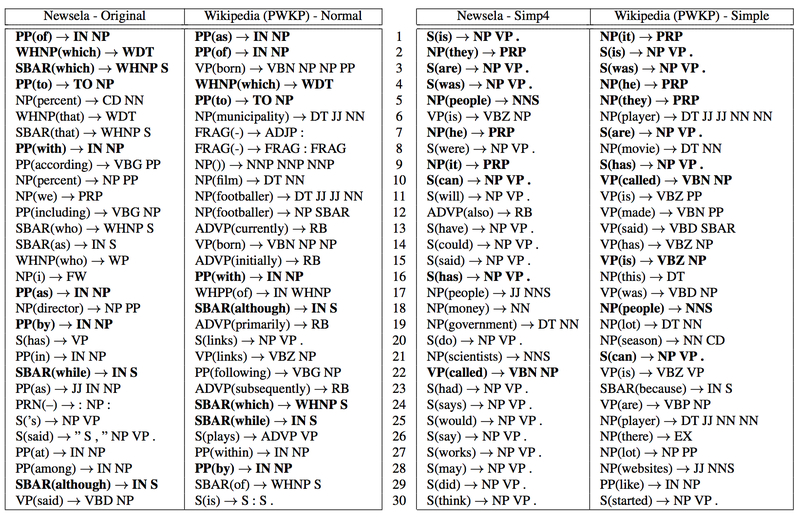 Table 2: The vocabulary size of the Parallel Wikipedia Simplification (PWKP) corpus and the vocabulary difference between its normal and simple sides (as a 2×2 matrix). Only words consisting of the 26 English letters are counted. 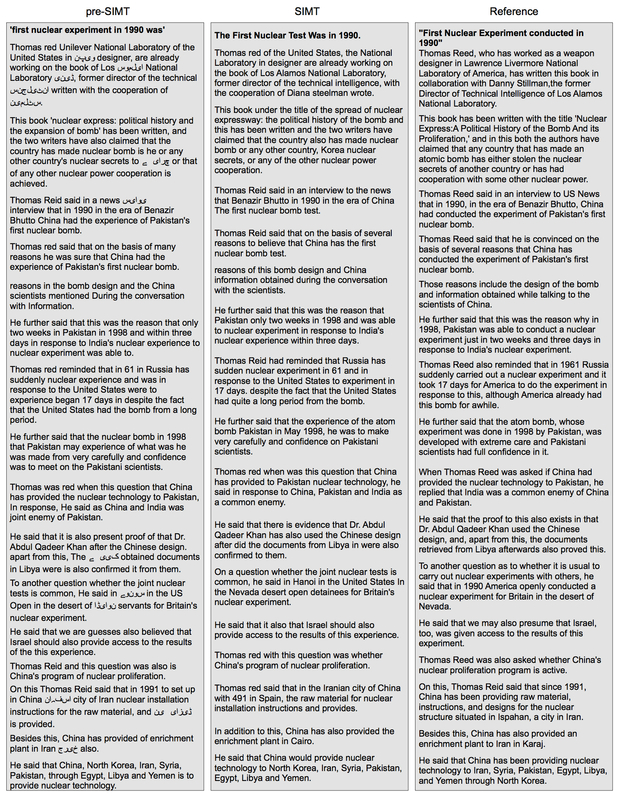 Table 3: Example of sentences written at multiple levels of text complexity from the Newsela data set. The Lexile readability score and grade level apply to the whole article rather than individual sentences, so the same sentences may receive different scores, e.g. the above sentences for the 6th and 7th grades. The bold font highlights the parts of sentence that are different from the adjacent version(s). 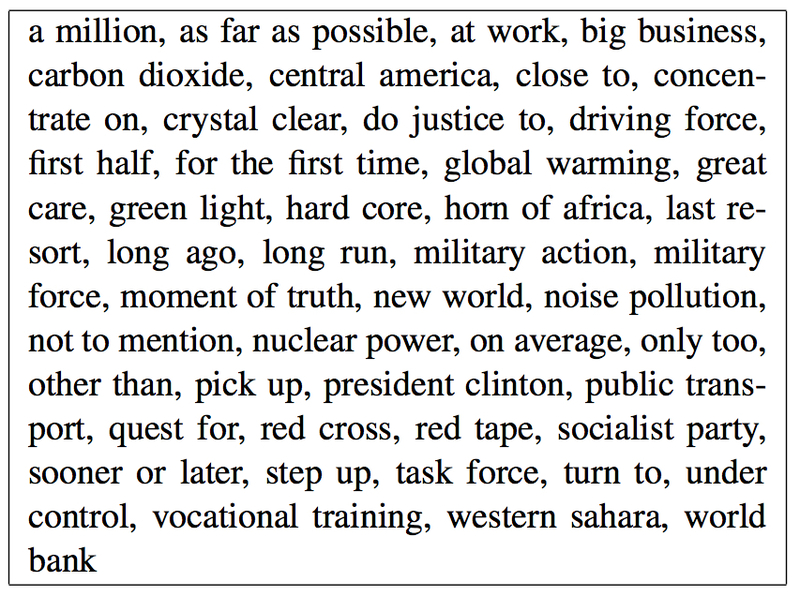 Figure 1: Manual classification of aligned sentence pairs from the Newsela corpus. 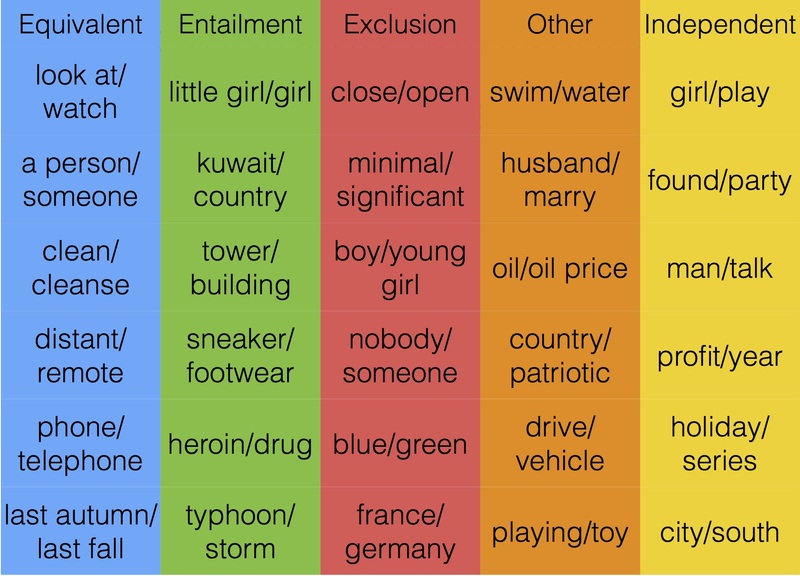 We categorize randomly sampled 50 sentence pairs drawn from the Original-Simp2 and 50 sentences from the Original-Simp4. 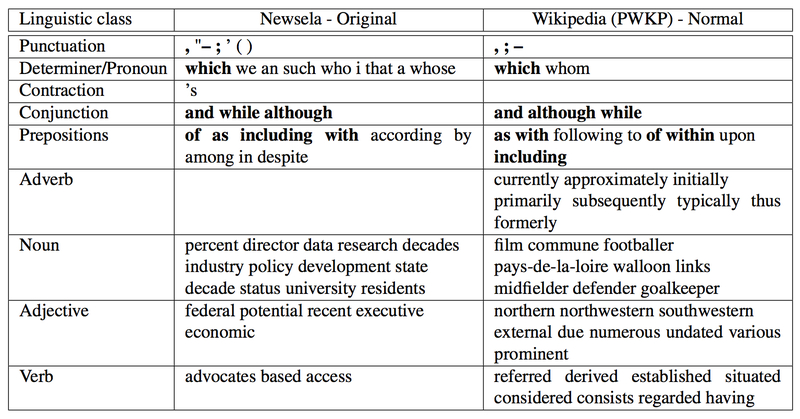 Table 4: Basic statistics of the Newsela Simplification corpus vs. the Parallel Wikipedia Simplification (PWKP) corpus. The Newsela corpus consists of 1130 articles with original and 4 simplified versions each. Simp-1 is of the least simplified level, while Simp-4 is the most simplified. The numbers marked by * are slightly different from previously reported, because of the use of different tokenizers. Table 5: This table shows the vocabulary changes between different levels of simplification in the Newsela corpus (as a 5×5 matrix). Each cell shows the number of unique word types that appear in the corpus listed in the column but do not appear in the corpus listed in the row. We also list the average frequency of those vocabulary items. For example, in the cell marked *, the Simp-4 version contains 583 unique words that do not appear in the Original version. By comparing the cells marked **, we see about half of the words (19,197 out of 39,046) in the Original version are not in the Simp-4 version. Most of the vocabulary that is removed consists of low-frequency words (with an average frequency of 2.6 in the Original). 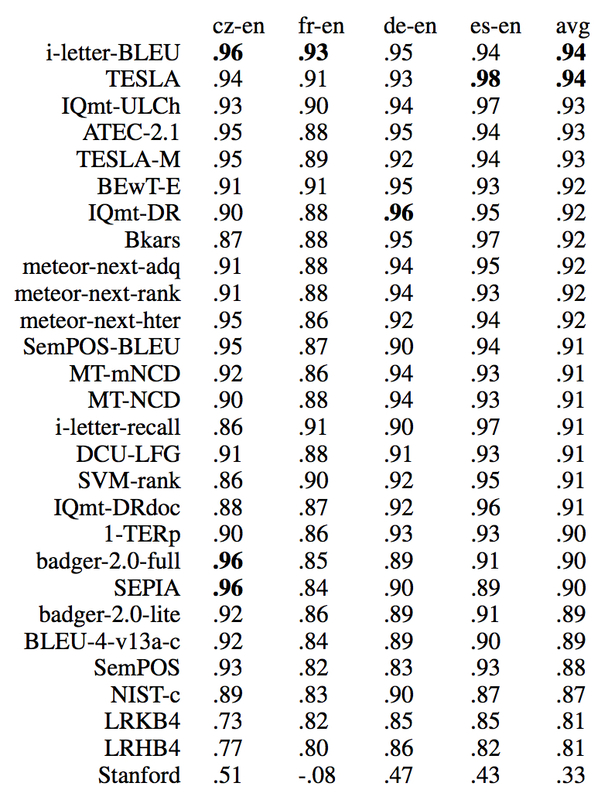 Table 6: Top 50 tokens associated with the complex text, computed using the Monroe et al. (2008) method. Bold words are shared by the complex version of Newsela and the complex version of Wikipedia. Table 7: Top 50 tokens associated with the simplified text. Table 8: Frequency of example words from Table 6. These complex words are reduced at a much greater rate in the simplified Newsela than they are in the Simple English Wikipedia. A smaller odds ratio indicates greater reduction. Table 9: Top 30 syntax patterns associated with the complex text (left) and simplified text (right). Bold patterns are the top patterns shared by Newsela and Wikipedia. Figure 2: Distribution of document-level compression ratio, displayed as a histogram smoothed by kernel density estimation. The Newsela corpus is more normally distributed, suggesting more consistent quality. Figure 3: A radar chart that visualizes the odds ratio (radius axis) of discourse connectives in simple side vs. complex side. An odds ratio larger than 1 indicates the word is more likely to occur in the simplified text than in the complex text, and vice versa. Simple cue words (in the shaded region), except “hence”, are more likely to be added during Newsela’s simplification process than in Wikipedia’s. 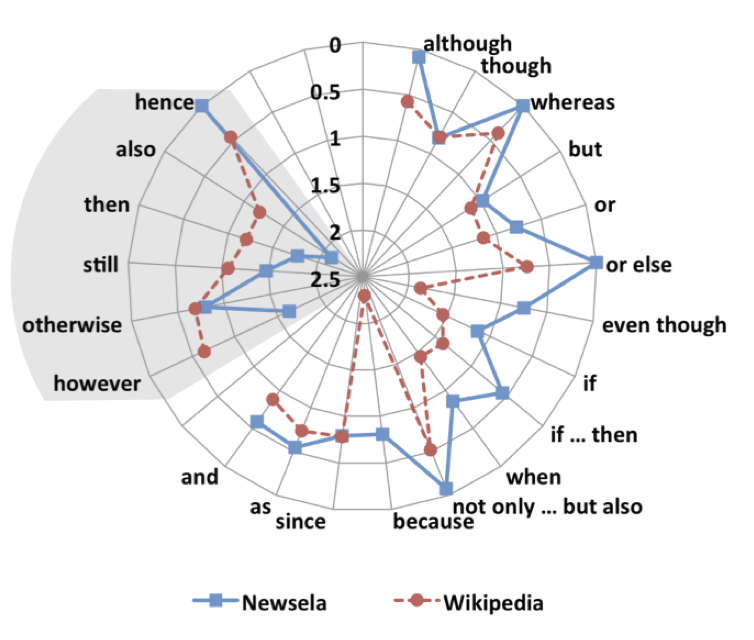 Complex conjunction connectives (in the unshaded region) are more likely to be retained in Wikipedia’s simplifications than in Newsela’s. Abstract: Translation of the output of automatic speech recognition (ASR) systems, also known as speech translation, has received a lot of research interest recently. This is especially true for programs such as DARPA BOLT which focus on improving spontaneous human-human conversation across languages. However, this research is hindered by the dearth of datasets developed for this explicit purpose. For Egyptian Arabic-English, in particular, no parallel speech-transcription-translation dataset exists in the same domain. 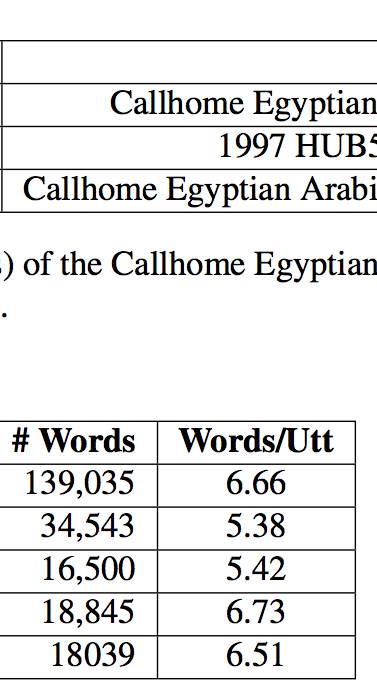 In order to support research in speech translation, we introduce the Callhome Egyptian Arabic-English Speech Translation Corpus. This supplements the existing LDC corpus with four reference translations for each utterance in the transcripts. 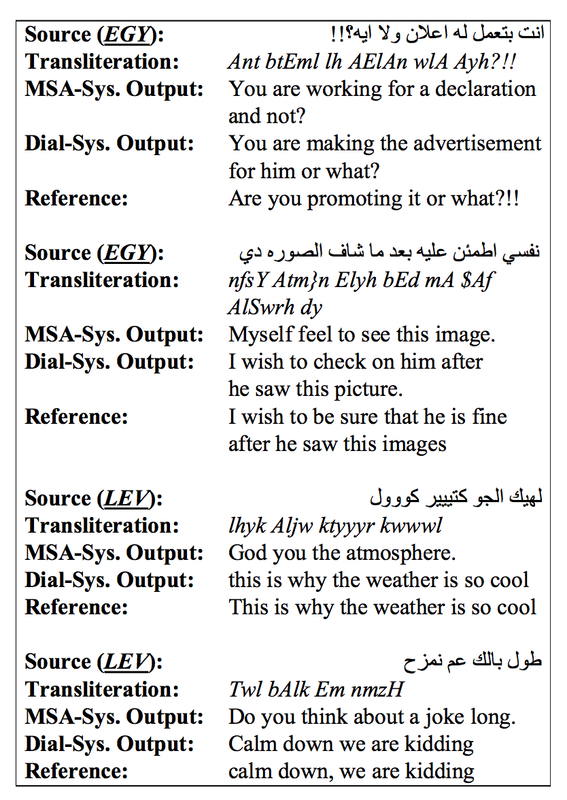 The result is a three-way parallel dataset of Egyptian Arabic Speech, transcriptions and English translations. Table 2: Partition statistics for the Callhome Egyptian Arabic corpus, supplements and evaluation datasets. Column 2,3 and 4 represent number of utterances, numbers of words and average number of words per utterance respectively. Table 3: A sample of the special symbols using in the Arabic transcripts. These represent non-conventional speech segments such as non-verbal vocalizations, disfluencies, background noise and distortion. Table 4: The results of the translation task described in section 4. Each utterance in the original partitions has about four redundant translations. The number of utterances in column 2 has hence effectively been multiplied by 4. The last column represents the number of words per utterance in the translations. Table 5: A sample of the translations obtained using the translation task described in section 4. The translations are lower-cased, tokenized and punctuation has been normalized. Abstract: We present a large scale study of the languages spoken by bilingual workers on Mechanical Turk (MTurk). We establish a methodology for determining the language skills of anonymous crowd workers that is more robust than simple surveying. We validate workers' self-reported language skill claims by measuring their ability to correctly translate words, and by geolocating workers to see if they reside in countries where the languages are likely to be spoken. Rather than posting a one-off survey, we posted paid tasks consisting of 1,000 assignments to translate a total of 10,000 words in each of 100 languages. Our study ran for several months, and was highly visible on the MTurk crowdsourcing platform, increasing the chances that bilingual workers would complete it. Our study was useful both to create bilingual dictionaries and to act as census of the bilingual speakers on MTurk. We use this data to recommend languages with the largest speaker populations as good candidates for other researchers who want to develop crowdsourced, multilingual technologies. To further demonstrate the value of creating data via crowdsourcing, we hire workers to create bilingual parallel corpora in six Indian languages, and use them to train statistical machine translation systems. Figure 1: The number of workers per country. This map was generated based on geolocating the IP address of 4,983 workers in our study. Omitted are 60 workers who were located in more than one country during the study, and 238 workers who could not be geolocated. The size of the circles represents the number of workers from each country. The two largest are India (1,998 workers) and the United States (866). To calibrate the sizes&colon; the Philippines has 142 workers, Egypt has 25, Russia has 10, and Sri Lanka has 4. 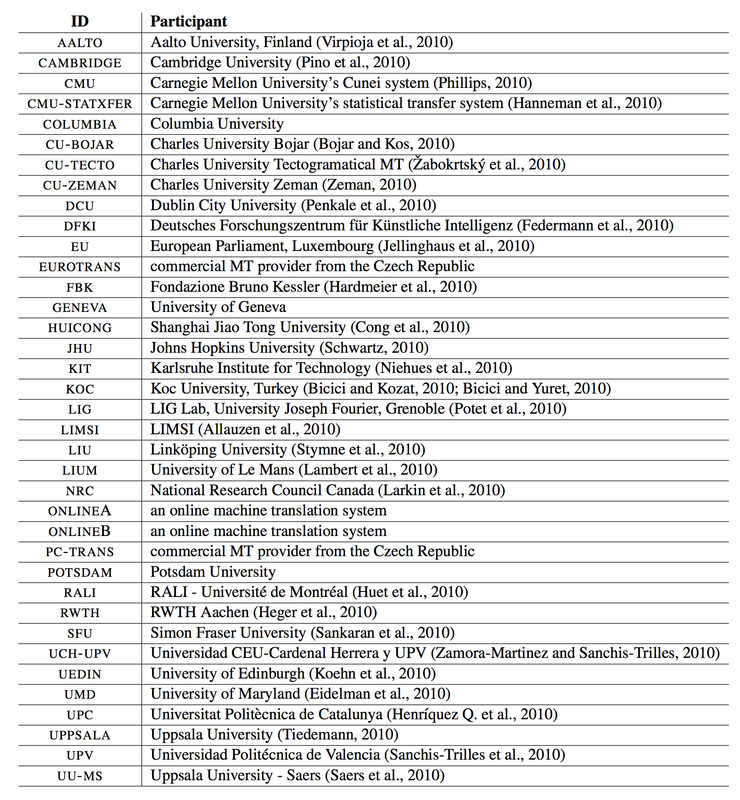 Table 2: A list of the languages that were used in our study, grouped by the number of Wikipedia articles in the language. Each language’s code is given in parentheses. These language codes are used in other figures throughout this paper. Figure 3: An example of the Turkers’ translations of a Hindi sentence. The translations are unedited and contain fixable spelling, capitalization and grammatical errors. Figure 2: Days to complete the translation HITs for 40 of the languages. Tick marks represent the completion of individual assignments. 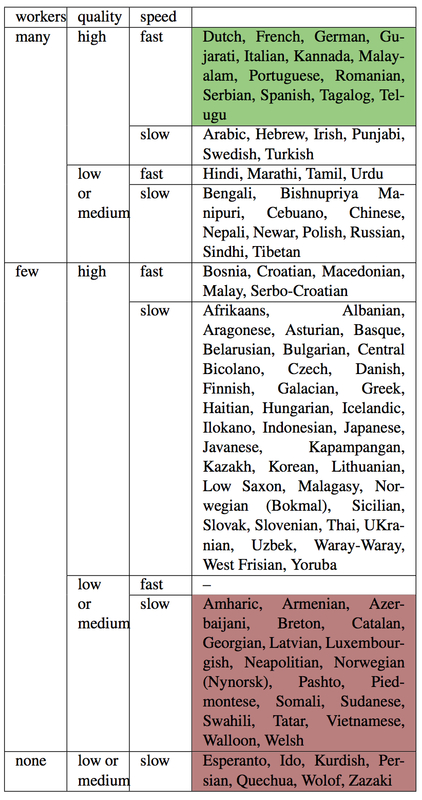 Figure 4: Translation quality for languages with at least 50 Turkers. The dark blue bars indicate the proportion of translations which exactly matched gold standard translations, and light blue indicate translations which were judged to be correct synonyms. Error bars show the 95% confidence intervals for each language. Figure 5: (a) Individual workers’ overlap with Google Translate. 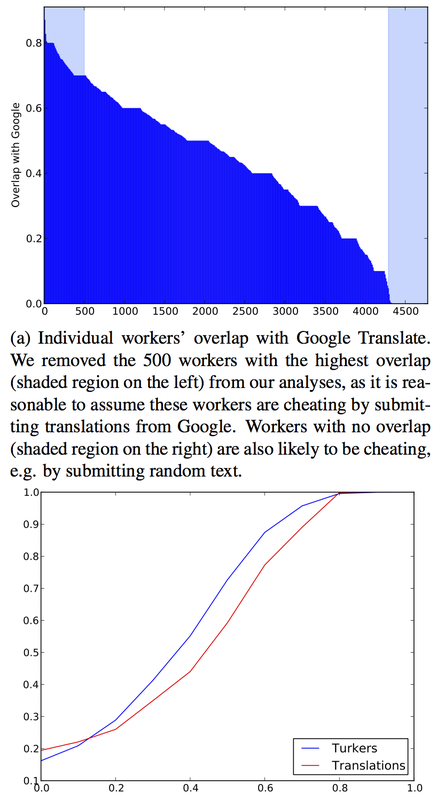 We removed the 500 workers with the highest overlap (shaded region on the left) from our analyses, as it is reasonable to assume these workers are cheating by submitting translations from Google. Workers with no overlap (shaded region on the right) are also likely to be cheating, e.g. by submitting random text. (b) Cumulative distribution of overlap with Google translate for workers and translations. We see that eliminating all workers with >70% overlap with google translate still preserves 90% of translations and >90% of workers. Table 3: Translation quality when partitioning the translations into two groups, one containing translations submitted by Turkers whose location is within regions that plausibly speak the foreign language, and the other containing translations from Turkers outside those regions. In general, in-region Turkers provide higher quality translations. (**) indicates differences significant at p=0.05, (*) at p=0.10. Figure 6: The total volume of translations (measured in English words) as a function of elapsed days. Table 4: Size of parallel corpora and bilingual dictionaries collected for each language. Table 5: BLEU scores for translating into English using bilingual parallel corpora by themselves, and with the addition of single-word dictionaries. Scores are calculated using four reference translations and represent the mean of three MERT runs. The Mechanical Turk crowdsourcing platform currently fails to provide the most basic piece of information to enable workers to make informed decisions about which tasks to undertake&colon; what is the expected hourly pay? Mechanical Turk advertises a reward amount per assignment, but does not give any indication of how long each assignment will take. We have developed a browser plugin that tracks the length of time it takes to complete a task, and a web service that aggregates the information across many workers. Crowd-Workers. com allows workers to discovery higher paying work by sorting tasks by estimated hourly rate. Abstract: The Mechanical Turk crowdsourcing platform currently fails to provide the most basic piece of information to enable workers to make informed decisions about which tasks to undertake&colon; what is the expected hourly pay? Mechanical Turk advertises a reward amount per assignment, but does not give any indication of how long each assignment will take. We have developed a browser plugin that tracks the length of time it takes to complete a task, and a web service that aggregates the information across many workers. Crowd-Workers. com allows workers to discovery higher paying work by sorting tasks by estimated hourly rate. 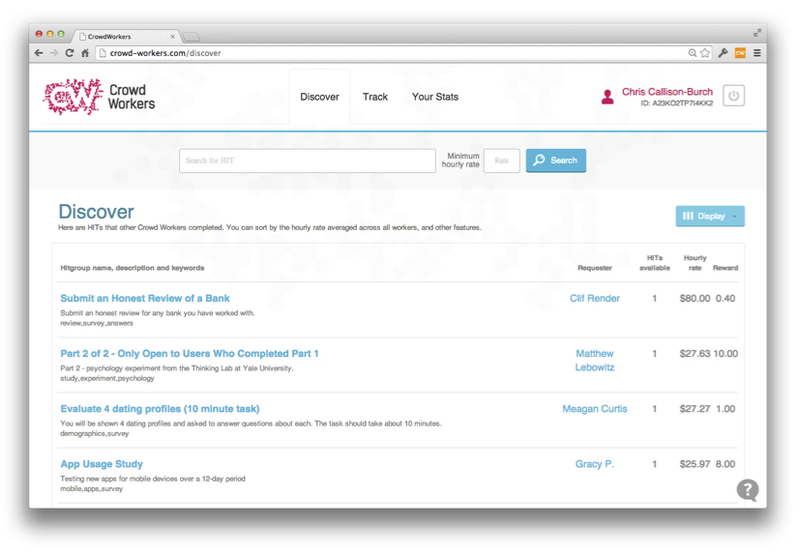 Figure 1: The crowd-workers.com web service allows users to sort HITs based on hourly rate. 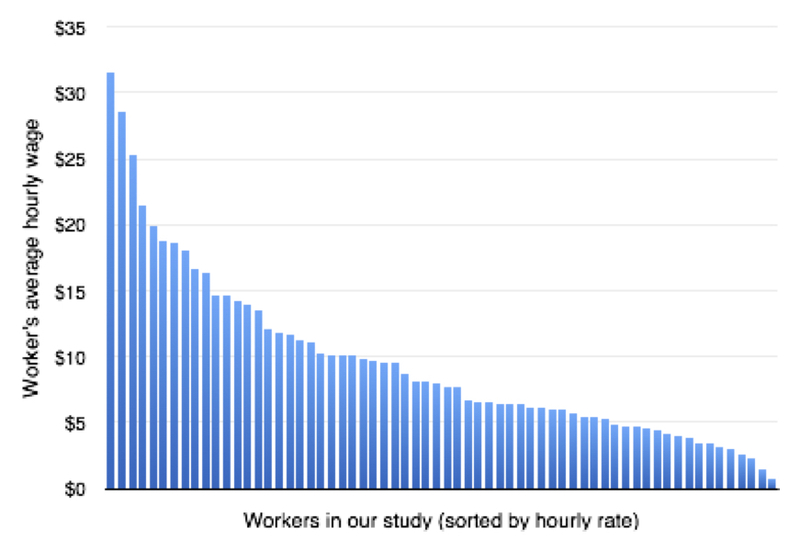 The hourly rate is estimated by tracking how long it took other workers to complete the task (using our browser extension), along with the reward amount (which MTurk makes available). Figure 2: The hourly earnings of the 65 Turkers in our pilot study who completed more than 100 HITs using the Crowd-Workers browser plugin. Abstract: We describe improvements made over the past year to Joshua, an open-source translation system for parsing-based machine translation. The main contributions this past year are significant improvements in both speed and usability of the grammar extraction and decoding steps. We have also rewritten the decoder to use a sparse feature representation, enabling training of large numbers of features with discriminative training methods. Figure 1: End-to-end runtime as a function of the number of threads. Each data point is the minimum of at least fifteen different runs. 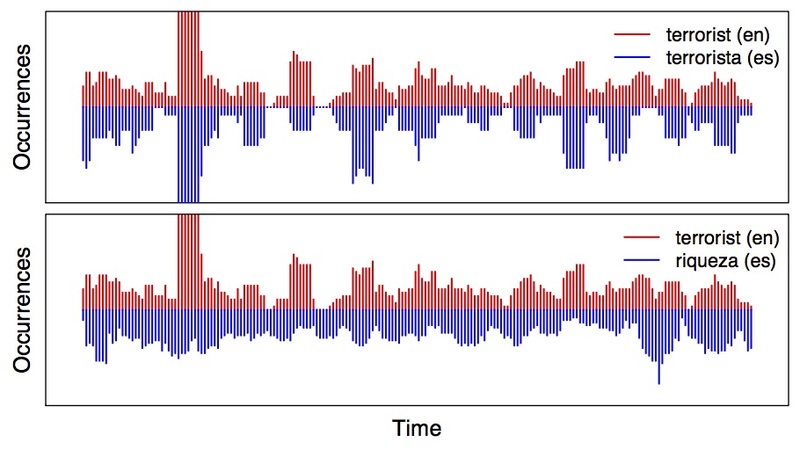 Figure 2: Decoding time alone. 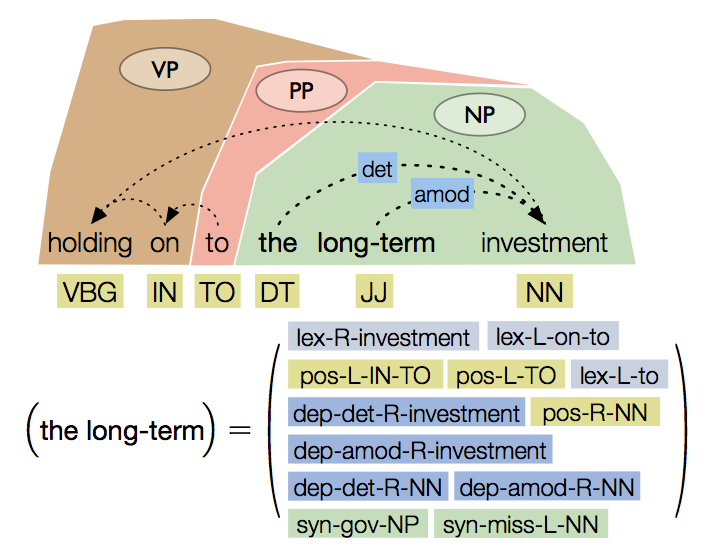 Figure 3: Here, position-aware lexical and part-of-speech n-gram features, labeled dependency links, and features reflecting the phrase’s CCG-style label NP/NN are included in the context vector. Table 1: Comparing Hadoop’s intermediate disk space use and extraction time on a selection of Europarl v.7 Hiero grammar extractions. Disk space was measured at its maximum, at the input of Thrax’s final grammar aggregation stage. Runtime was measured on our Hadoop cluster with a capacity of 52 mappers and 26 reducers. 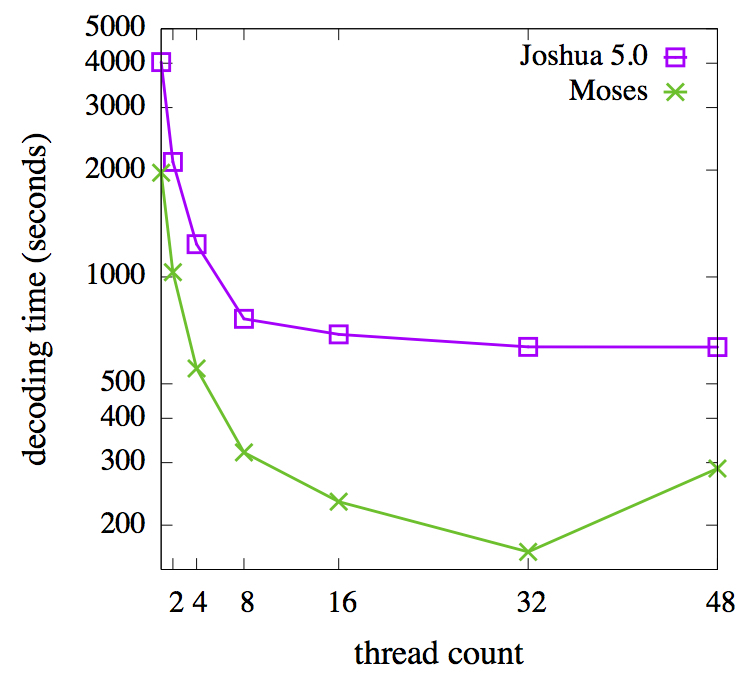 On average Thrax 2.0, bundled with Joshua 5.0, is up to 300% faster and more compact. We present the 1.0 release of our paraphrase database, PPDB. Its English portion, PPDB&colon;Eng, contains over 220 million paraphrase pairs, consisting of 73 million phrasal and 8 million lexical paraphrases, as well as 140 million paraphrase patterns, which capture many meaning-preserving syntactic transformations. The paraphrases are extracted from bilingual parallel corpora totaling over 100 million sentence pairs and over 2 billion English words. We also release PPDB&colon;Spa, a collection of 196 million Spanish paraphrases. 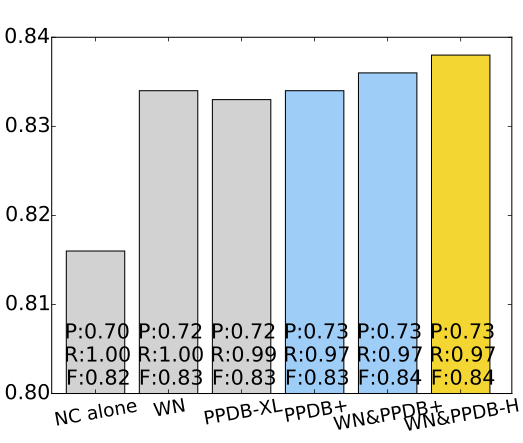 Each paraphrase pair in PPDB contains a set of associated scores, including paraphrase probabilities derived from the bitext data and a variety of monolingual distributional similarity scores computed from the Google n-grams and the Annotated Gigaword corpus. Our release includes pruning tools that allow users to determine their own precision/recall tradeoff. Abstract: We present the 1.0 release of our paraphrase database, PPDB. Its English portion, PPDB&colon;Eng, contains over 220 million paraphrase pairs, consisting of 73 million phrasal and 8 million lexical paraphrases, as well as 140 million paraphrase patterns, which capture many meaning-preserving syntactic transformations. The paraphrases are extracted from bilingual parallel corpora totaling over 100 million sentence pairs and over 2 billion English words. We also release PPDB&colon;Spa, a collection of 196 million Spanish paraphrases. 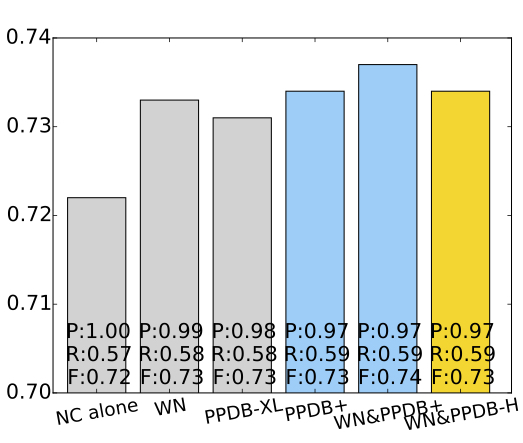 Each paraphrase pair in PPDB contains a set of associated scores, including paraphrase probabilities derived from the bitext data and a variety of monolingual distributional similarity scores computed from the Google n-grams and the Annotated Gigaword corpus. Our release includes pruning tools that allow users to determine their own precision/recall tradeoff. 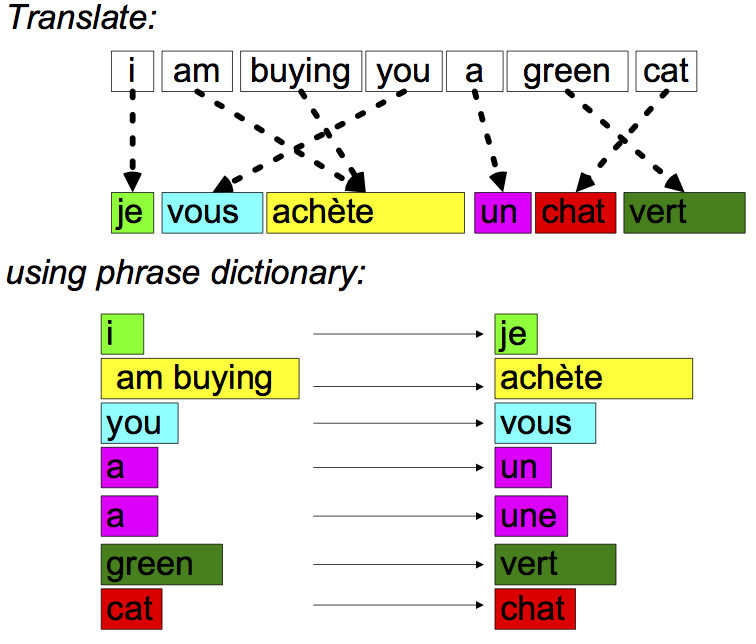 Figure 1: Phrasal paraphrases are extracted via bilingual pivoting. Figure 2: Features extracted for the phrase the long term from the n-gram corpus (2a) and Annotated Gigaword (2b). 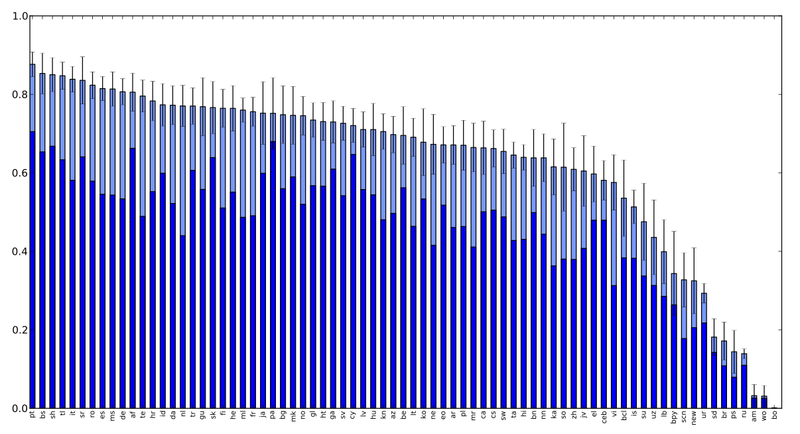 (a) The n-gram corpus records the long-term as preceded by revise (43 times), and followed by plans (97 times). We add corresponding features to the phrase’s distributional signature retaining the counts of the original n-grams. 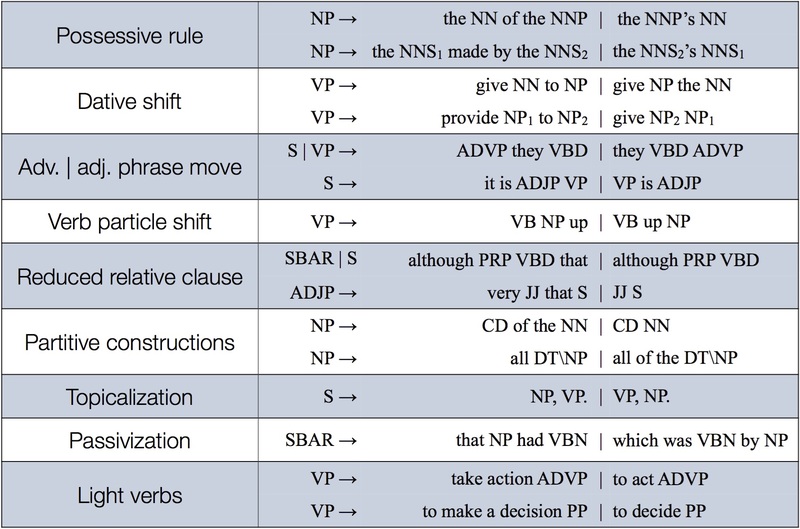 (b) Here, position-aware lexical and part-of-speech n-gram features, labeled dependency links , and features reflecting the phrase’s CCG-style label NP/NN are included in the context vector. Table 1: A breakdown of PPDB&colon;Eng size by paraphrase type. We distinguish lexical (i.e. one-word) paraphrases, phrasal paraphrases and syntactically labeled paraphrase patterns. Table 2: An overview of PPDB&colon;Spa. Again, we partition the resource into lexical (i.e. one-word) paraphrases, phrasal paraphrases and syntactically labeled paraphrase patterns. Figure 3: To inspect our coverage, we use the Penn Treebank’s parses to map from Propbank annotations to PPDB’s syntactic patterns. For the above annotation predicate, we extract VBP ! expect, which is matched by paraphrase rules like VBP ! expect | anticipate and VBP ! expect | hypothesize. To search for the entire relation, we replace the argument spans with syntactic nonterminals. Here, we obtain S ! NP expect S, for which PPDB has matching rules like S ! NP expect S | NP would hope S, and S ! NP expect S | NP trust S. This allows us to apply sophisticated paraphrases to the predicate while capturing its arguments in a generalized fashion. Figure 4: An illustration of PPDB’s coverage of the manually annotated Propbank predicate phrases (4a) and binary relations with argument non-terminals (4b). The curves indicate the coverage on tokens (solid) and types (dotted), as well as the average number of paraphrases per covered type (dashed) at the given pruning level. (a) PPDB&colon;Eng coverage of Propbank predicates (top), and average human judgment score (bottom) for varying pruning thresholds. (b) PPDB&colon;Eng’s coverage of Propbank predicates with up to two arguments. Here we consider rules that paraphrase the full predicate-argument expression. Abstract: Prior research into learning translations from source and target language monolingual texts has treated the task as an unsupervised learning problem. Although many techniques take advantage of a seed bilingual lexicon, this work is the first to use that data for supervised learning to combine a diverse set of signals derived from a pair of monolingual corpora into a single discriminative model. Even in a low resource machine translation setting, where induced translations have the potential to improve performance substantially, it is reasonable to assume access to some amount of data to perform this kind of optimization. Our work shows that only a few hundred translation pairs are needed to achieve strong performance on the bilingual lexicon induction task, and our approach yields an average relative gain in accuracy of nearly 50% over an unsupervised baseline. 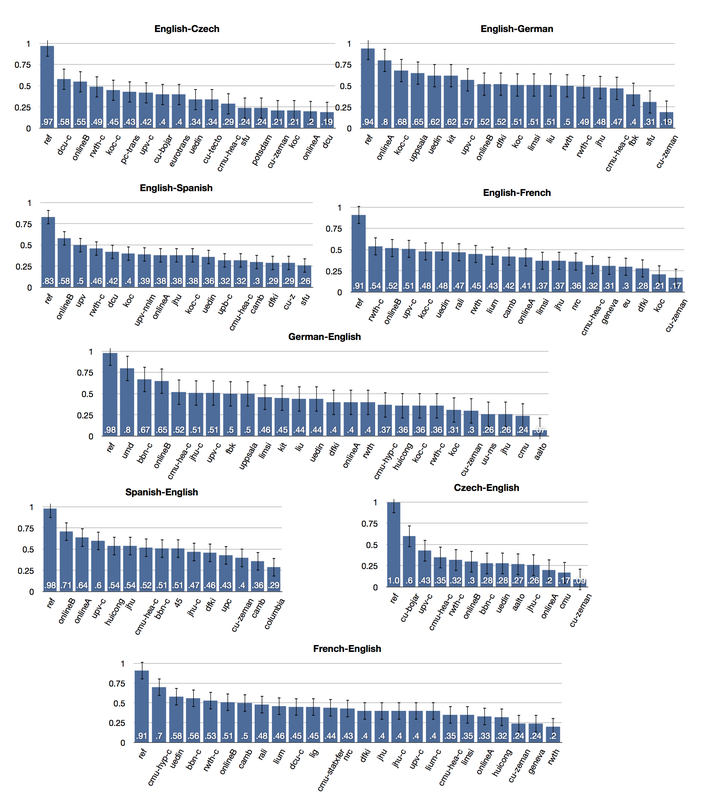 Large gains in accuracy hold for all 22 languages (low and high resource) that we investigate. Figure 1: Each box-and-whisker plot summarizes performance on the development set using the given feature(s) across all 22 languages. For each source word in our development sets, we rank all English target words according to the monolingual similarity metric(s) listed. All but the last plot show the performance of individual features. Discrim-All uses supervised data to train classifiers for each language based on all of the features. Figure 2: Performance on the development set goes up as features are greedily added to the feature space. Mean performance is slightly higher using this subset of six features (second to last bar) than using all features (last bar). Figure 3: Learning curves over number of positive training instances, up to 1250. For some languages, 1250 positive training instances are not available. In all cases, evaluation is on the development data and the number of negative training instances is three times the number of positive. For all languages, performance is fairly stable after about 300 positive training instances. Table 2: Top-10 Accuracy on test set. Performance increases for all languages moving from the baseline (MRR) to discriminative training (Supv). Research into the translation of the output of automatic speech recognition (ASR) systems is hindered by the dearth of datasets developed for that explicit purpose. For Spanish-English translation, in particular, most parallel data available exists only in vastly different domains and registers. In order to support research on cross-lingual speech applications, we introduce the Fisher and Callhome Spanish-English Speech Translation Corpus, supplementing existing LDC audio and transcripts with (a) ASR 1-best, lattice, and oracle output produced by the Kaldi recognition system and (b) English translations obtained on Amazon’s Mechanical Turk. The result is a four-way parallel dataset of Spanish audio, transcriptions, ASR lattices, and English translations of approximately 38 hours of speech, with defined training, development, and held-out test sets. We conduct baseline machine translation experiments using models trained on the provided training data, and validate the dataset by corroborating a number of known results in the field, including the utility of in-domain (information, conversational) training data, increased performance translating lattices (instead of recognizer 1-best output), and the relationship between word error rate and BLEU score. Abstract: Research into the translation of the output of automatic speech recognition (ASR) systems is hindered by the dearth of datasets developed for that explicit purpose. For Spanish-English translation, in particular, most parallel data available exists only in vastly different domains and registers. In order to support research on cross-lingual speech applications, we introduce the Fisher and Callhome Spanish-English Speech Translation Corpus, supplementing existing LDC audio and transcripts with (a) ASR 1-best, lattice, and oracle output produced by the Kaldi recognition system and (b) English translations obtained on Amazon’s Mechanical Turk. The result is a four-way parallel dataset of Spanish audio, transcriptions, ASR lattices, and English translations of approximately 38 hours of speech, with defined training, development, and held-out test sets. We conduct baseline machine translation experiments using models trained on the provided training data, and validate the dataset by corroborating a number of known results in the field, including the utility of in-domain (information, conversational) training data, increased performance translating lattices (instead of recognizer 1-best output), and the relationship between word error rate and BLEU score. Table 1: Corpus size and cost. Counts of segments and words were computed after pre-processing (§2). Table 2: Data splits for Fisher Spanish (top), Callhome Spanish (middle), and Europarl + News Commentary (bottom; for comparison). Words is the number of Spanish word tokens (after tokenization). The mean number of words per sentences ranges from 11.8 to 13.1. Table 4: BLEU scores (four references) on Fisher/Dev2. The columns vary the data used to train the MT system, and the rows alter the interface between the ASR and MT systems. Table 5: BLEU scores (one reference) on Callhome/Evltest. Figure 1: A subgraph of a lattice (sentence 17 of Fisher/Dev2) representing an ASR ambiguity. The oracle path is in bold. With access to the lattice, the MT system avoids the untranslatable word incorporamos, found in the 1-best output, producing a better translation. Above the line are inputs and the reference, with the Lattice line denoting the path selected by the MT system. The Google line is suggestive of the general difficulty in translating conversational speech. Figure 2: Conversation-level WER and BLEU, for conversations found in Fisher/Dev (open points) and Fisher/Dev2 (solid points). The Pearson’s correlation coefficient is -0.72. Abstract: We present Joshua 4.0, the newest version of our open-source decoder for parsing-based statistical machine translation. The main contributions in this release are the introduction of a compact grammar representation based on packed tries, and the integration of our implementation of pairwise ranking optimization, J-PRO. We further present the extension of the Thrax SCFG grammar extractor to pivot-based extraction of syntactically informed sentential paraphrases. Figure 1: An illustration of our packed grammar data structures. The source sides of the grammar rules are stored in a packed trie. Each node may contain n children and the symbols linking to them, and m entries for rules that share the same source side. Each rule entry links to a node in the target-side trie, where the full target string can be retrieved by walking up the trie until the root is reached. The rule entries also contain a data block id, which identifies feature data attached to the rule. The features are encoded according to a type/quantization specification and stored as variable-length blocks of data in a byte buffer. 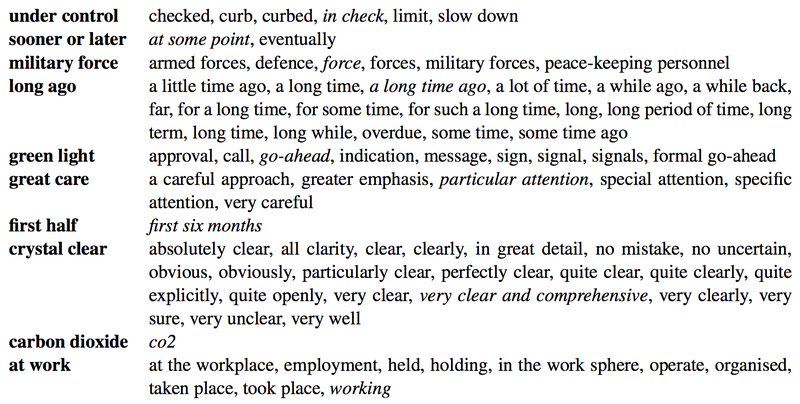 Table 1: Decoding-time memory use for the packed grammar versus the standard grammar format. 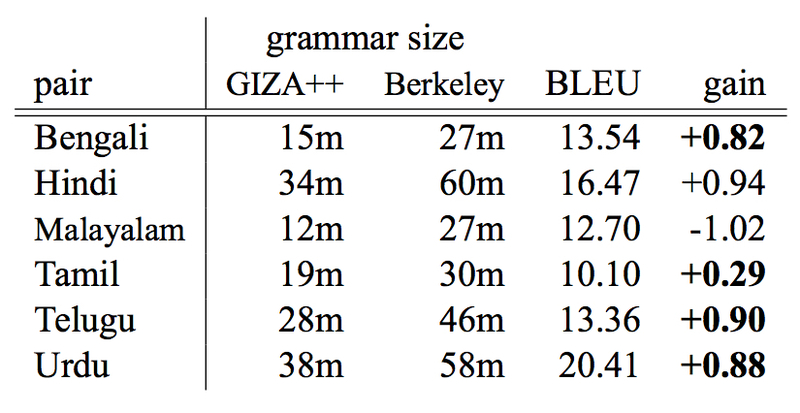 Even without lossy quantization the packed grammar representation yields significant savings in memory consumption. Adding 8-bit quantization for the real- valued features in the grammar reduces even large syntactic grammars to a manageable size. 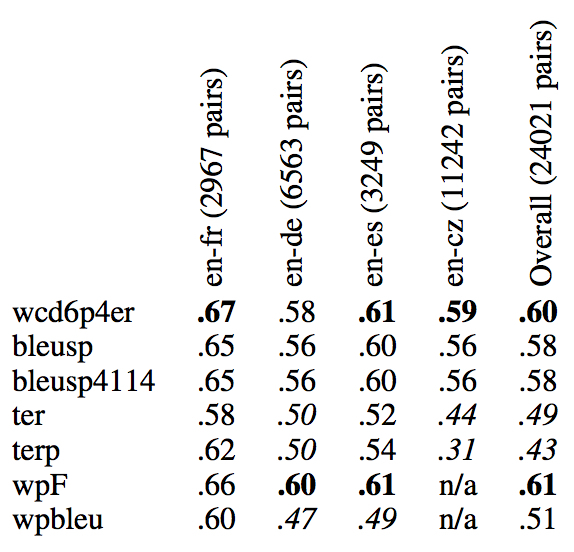 Figure 2: A visualization of the loading and decoding speed on the WMT12 French-English development set contrasting the packed grammar representation with the standard format. 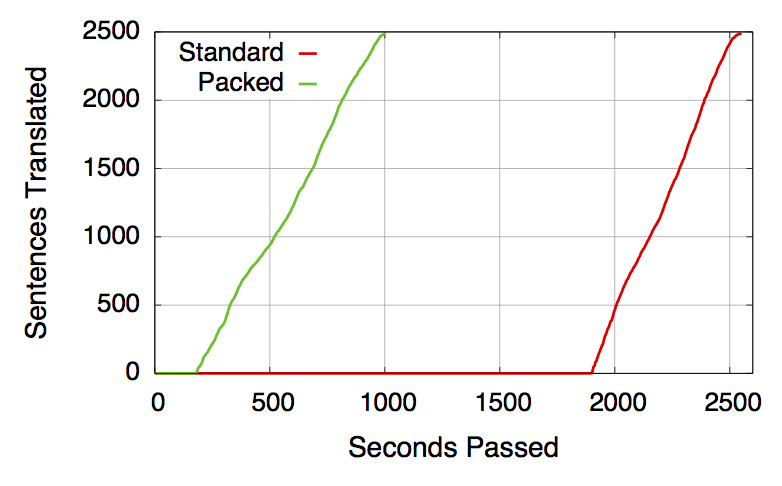 Grammar loading for the packed grammar representation is substantially faster than that for the baseline setup. Even with a slightly slower decoding speed (note the difference in the slopes) the packed grammar finishes in less than half the time, compared to the standard format. Figure 3: Experimental results on the development and test sets. The x-axis is the number of iterations (up to 30) and the y-axis is the BLEU score. The three curves in each figure correspond to three classifiers. 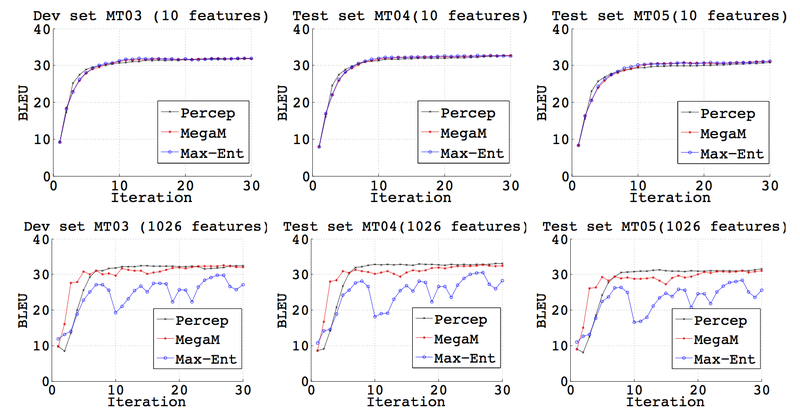 Upper row&colon; results trained using only dense features (10 features); Lower row&colon; results trained using dense+sparse features (1026 features). Left column&colon; development set (MT03); Middle column&colon; test set (MT04); Right column&colon; test set (MT05). Table 2: Comparison between the results given by Z-MERT and J-PRO (trained with 10 features). Table 3: Extraction times and grammar sizes for Hiero grammars using the Europarl and News Commentary training data for each listed language pair. Table 4: Extraction times and grammar sizes for the SAMT grammars using the Europarl and News Commentary training data for each listed language pair. Table 5: Large paraphrase grammars extracted from EuroParl data using Thrax. The sentence and word counts refer to the English side of the bitexts used. Abstract: We estimate the parameters of a phrase-based statistical machine translation system from monolingual corpora instead of a bilingual parallel corpus. We extend existing research on bilingual lexicon induction to estimate both lexical and phrasal translation probabilities for MT-scale phrase-tables. We propose a novel algorithm to estimate re-ordering probabilities from monolingual data. We report translation results for an end-to-end translation system using these monolingual features alone. Our method only requires monolingual corpora in source and target languages, a small bilingual dictionary, and a small bitext for tuning feature weights. 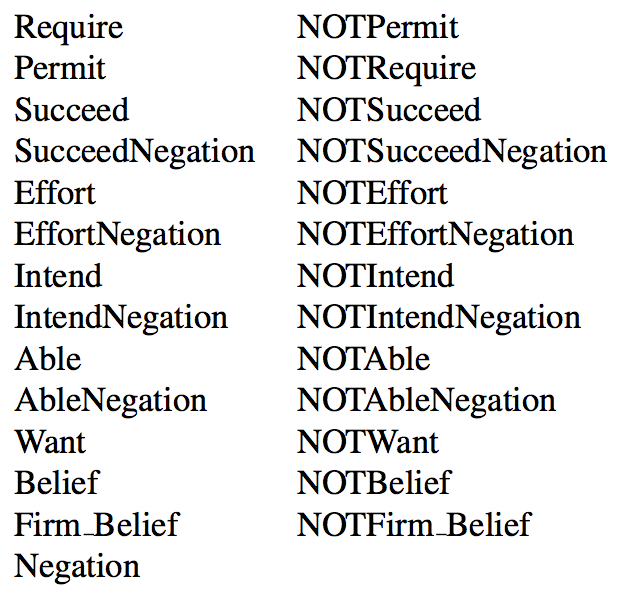 In this paper, we examine an idealization where a phrase-table is given. We examine the degradation in translation performance when bilingually estimated translation probabilities are removed, and show that 82%+ of the loss can be recovered with monolingually estimated features alone. We further show that our monolingual features add 1.5 BLEU points when combined with standard bilingually estimated phrase table features. 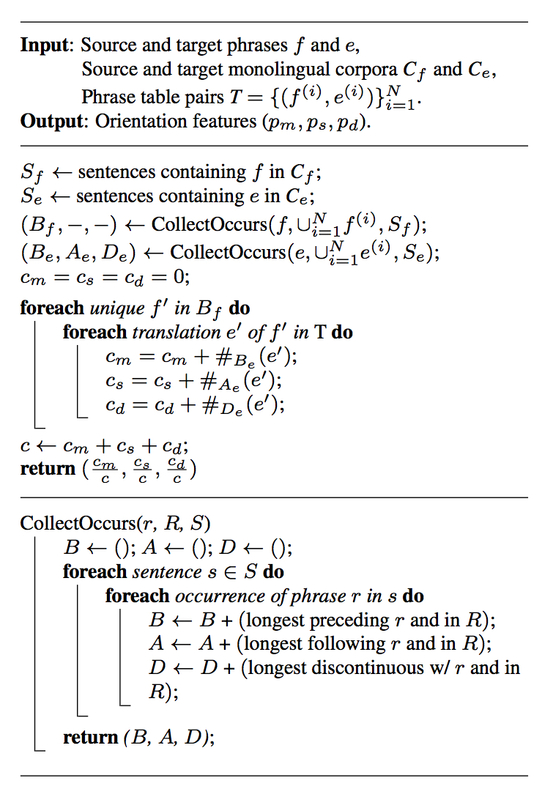 Figure 1: The reordering probabilities from the phrasebased models are estimated from bilingual data by calculating how often in the parallel corpus a phrase pair (f; e) is orientated with the preceding phrase pair in the 3 types of orientations (monotone, swapped, and discontinuous). 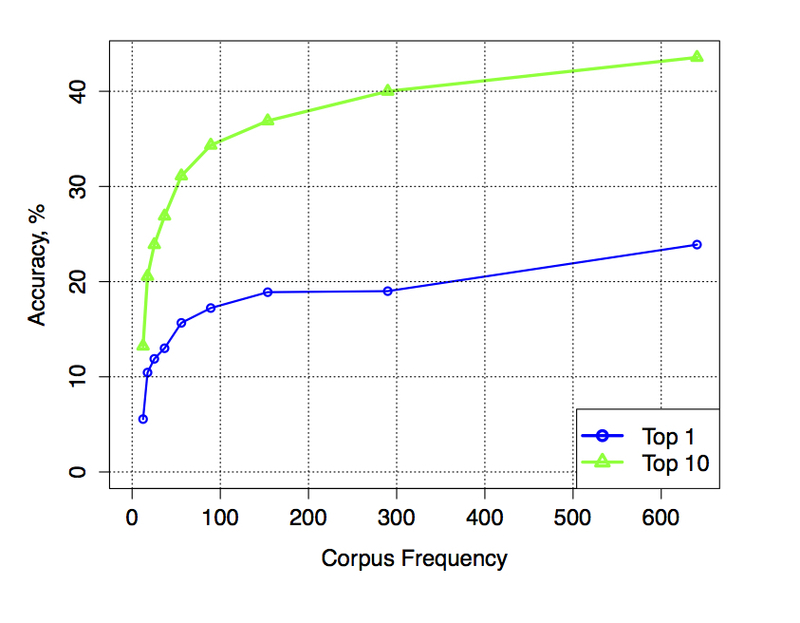 Figure 2: Accuracy of single-word translations induced using contextual similarity as a function of the source word corpus frequency. Accuracy is the proportion of the source words with at least one correct (bilingual dictionary) translation in the top 1 and top 10 candidate lists. 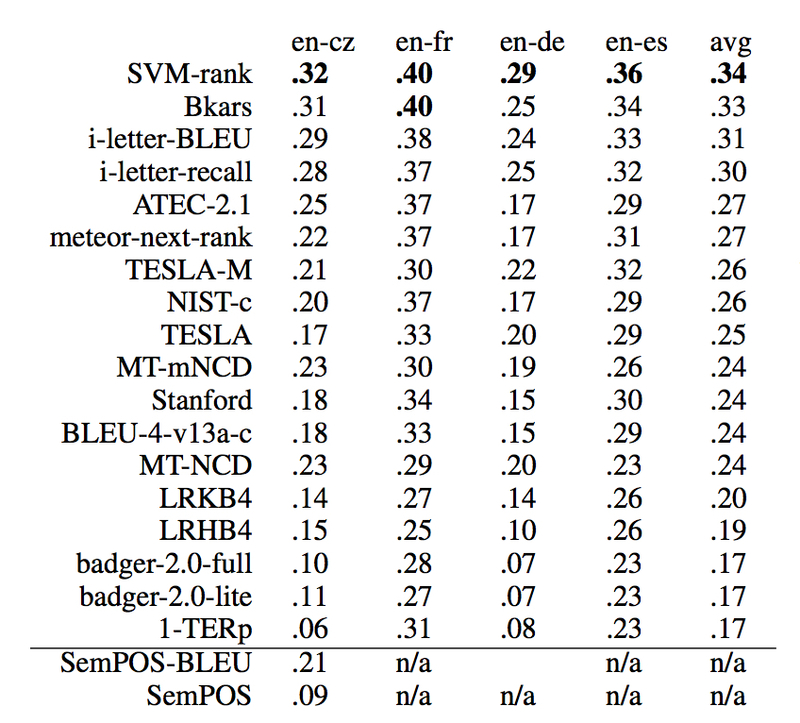 Figure 3: Scoring contextual similarity of phrases&colon; first, contextual vectors are projected using a small seed dictionary and then compared with the target language candidates. 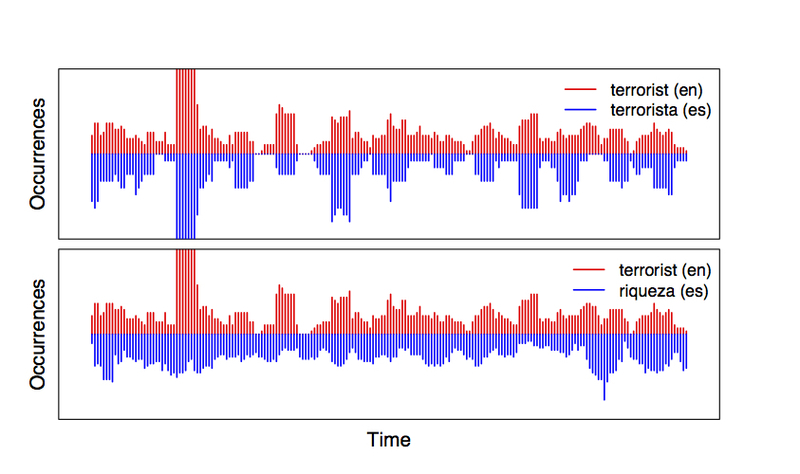 Figure 4: Temporal histograms of the English phrase terrorist, its Spanish translation terrorista, and riqueza (wealth) collected from monolingual texts spanning a 13 year period. While the correct translation has a good temporal match, the non-translation riqueza has a distinctly different signature. Figure 5: Algorithm for estimating reordering probabilities from monolingual data. 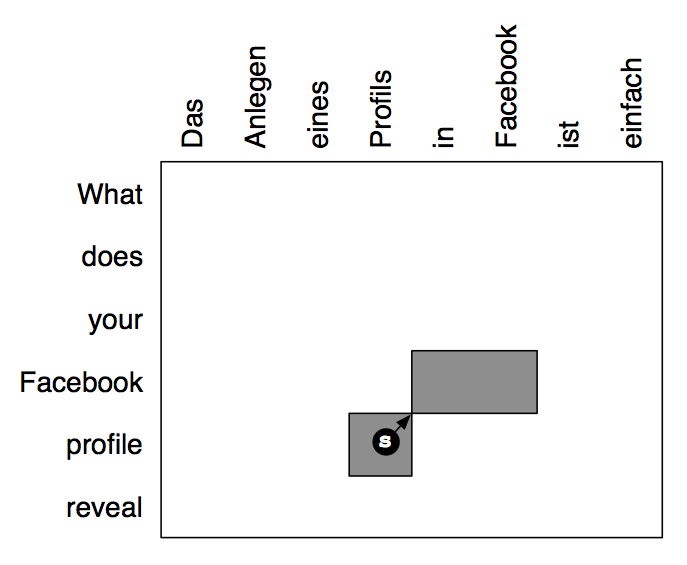 Figure 6: Collecting phrase orientation statistics for a English-German phrase pair (“profile”, “Profils”) from non-parallel sentences (the German sentence translates as “Creating a Facebook profile is easy”). Table 1: Statistics about the monolingual training data and the phrase table that was used in all of the experiments. 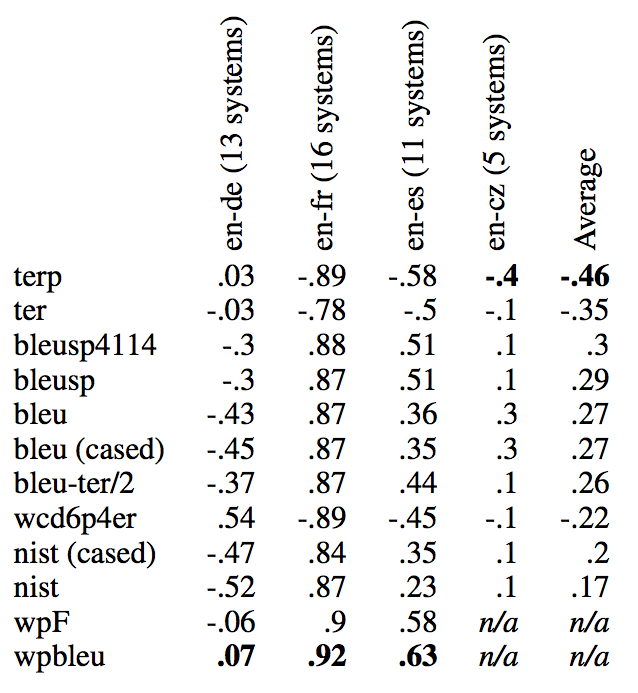 Figure 7: Much of the loss in BLEU score when bilingually estimated features are removed from a Spanish-English translation system (experiments 1-4) can be recovered when they are replaced with monolingual equivalents estimated from monolingual Europarl data (experiments 5-10). The labels indicate how the different types of parameters are estimated, the first part is for phrase-table features, the second is for reordering probabilities. 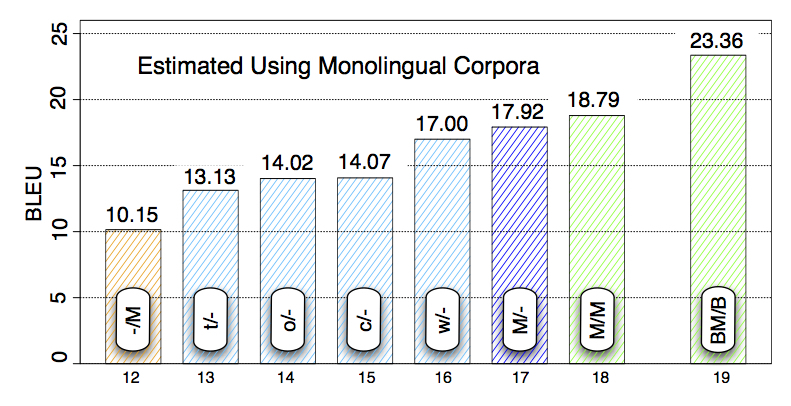 Figure 8: Performance of monolingual features derived from truly monolingual corpora. Over 82% of the BLEU score loss can be recovered. Abstract: Arabic dialects present many challenges for machine translation, not least of which is the lack of data resources. We use crowdsourcing to cheaply and quickly build Levantine-English and Egyptian-English parallel corpora, consisting of 1.1M words and 380k words, respectively. The dialect sentences are selected from a large corpus of Arabic web text, and translated using Mechanical Turk. We use this data to build Dialect Arabic MT systems. Small amounts of dialect data have a dramatic impact on the quality of translation. 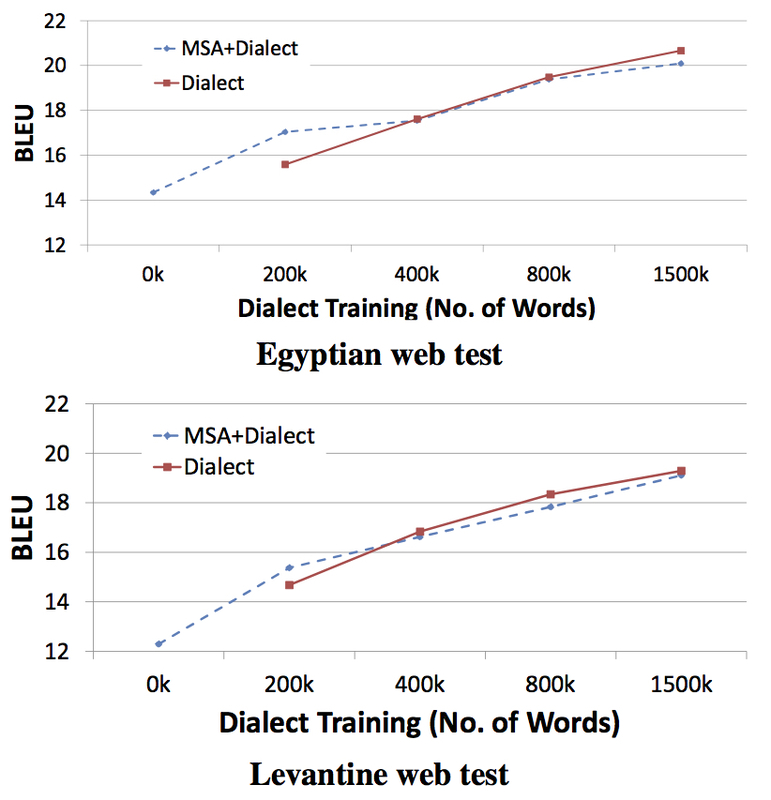 When translating Egyptian and Levantine test sets, our Dialect Arabic MT system performs 5.8 and 6.8 BLEU points higher than a Modern Standard Arabic MT system trained on a 150 million word Arabic-English parallel corpus -- over 100 times the amount of data as our dialect corpora. 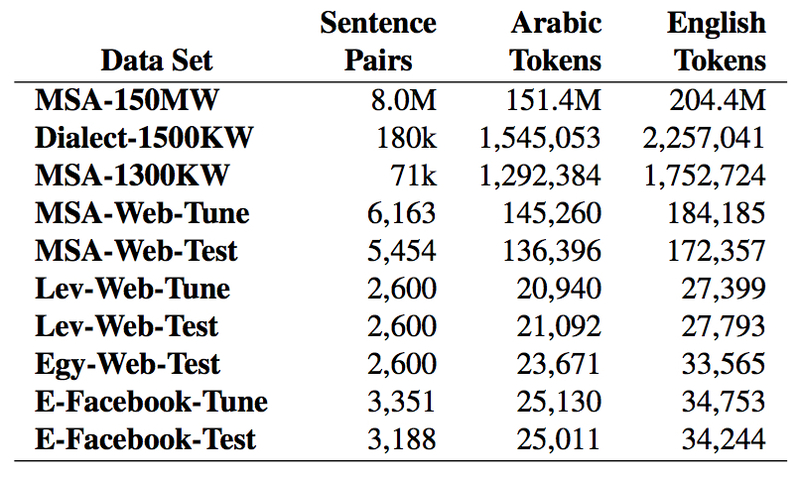 Table 1: The total costs for the three MTurk subtasks involved with the creation of our Dialectal Arabic-English parallel corpus. Table 2: Statistics about the training/tuning/test datasets used in our experiments. The token counts are calculated before MADA segmentation. 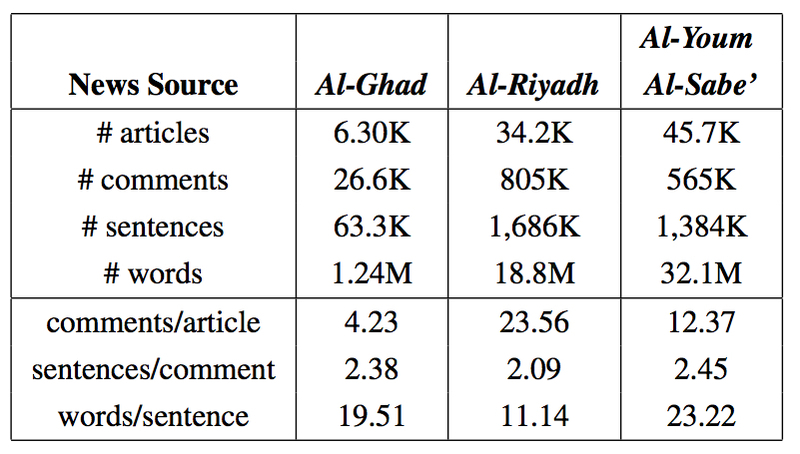 Table 3: Comparison of the effect of morphological segmentation when translating MSA web text and Dialectal Arabic web text. The morphological segmentation uniformly improves translation quality, but the improvements are more dramatic for MSA than for Dialectal Arabic when comparing similarly-sized training corpora. Table 4: A comparison of translation quality of Egyptian, Levantine, and MSA web text, using various training corpora. 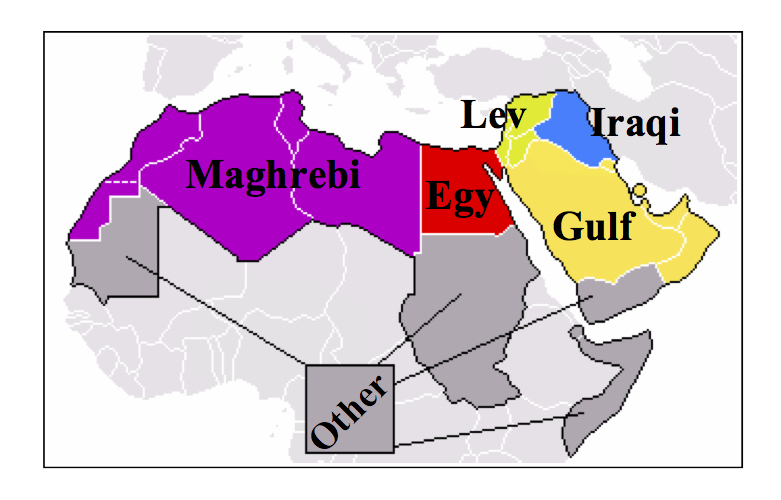 The highest BLEU scores are achieved using the full set of dialectal data (which combines Levantine and Egyptian), since the Egyptian alone is sparse. For Levantine, adding Egyptian has no effect. In both cases, adding MSA to the dialectal data results in marginally worse translations. Table 5: The most frequent OOV’s (with counts ≥ 10) of our test sets against the MSA training data. 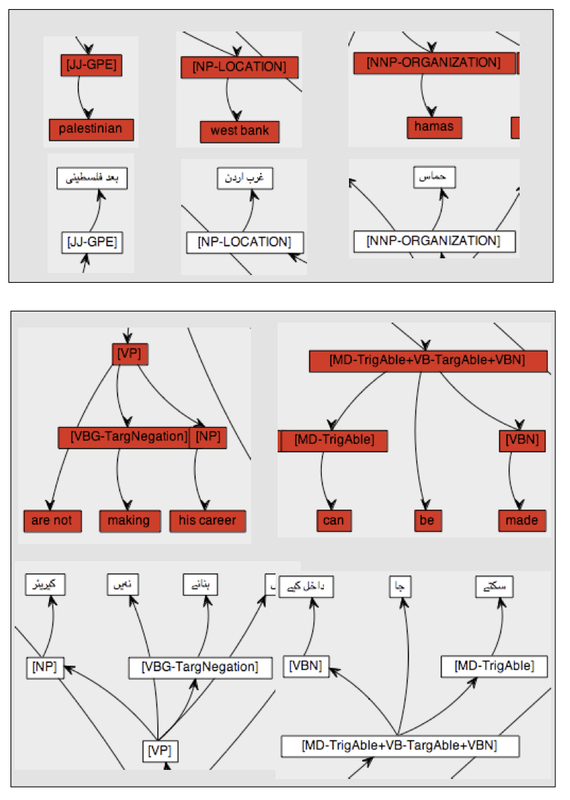 Figure 2: Examples of improvement in MT output when training on our Dialectal Arabic-English parallel corpus instead of an MSA-English parallel corpus. 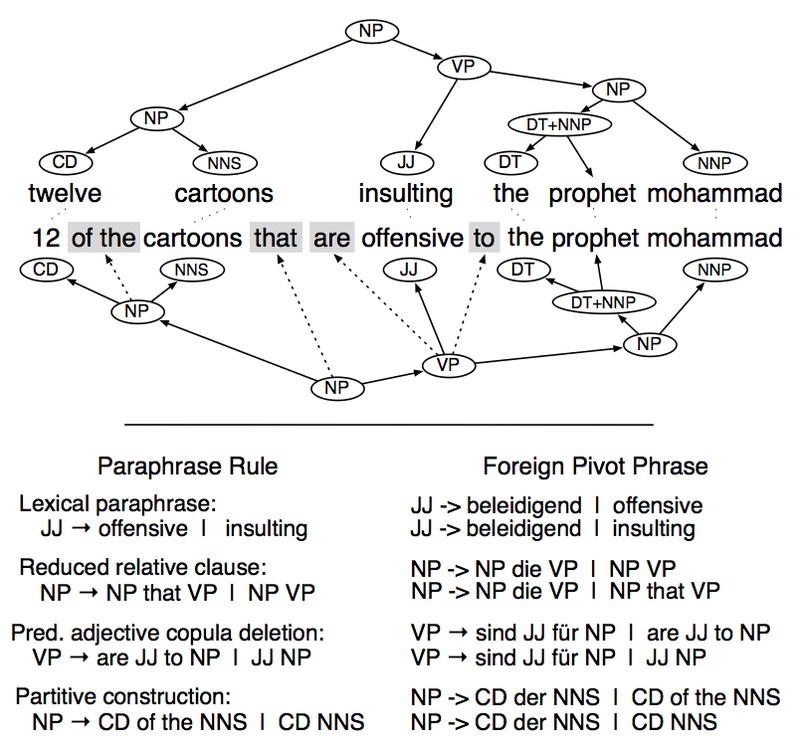 Figure 3: Examples of ambiguous words that are translated incorrectly by the MSA-English system, but correctly by the Dialectal Arabic-English system. 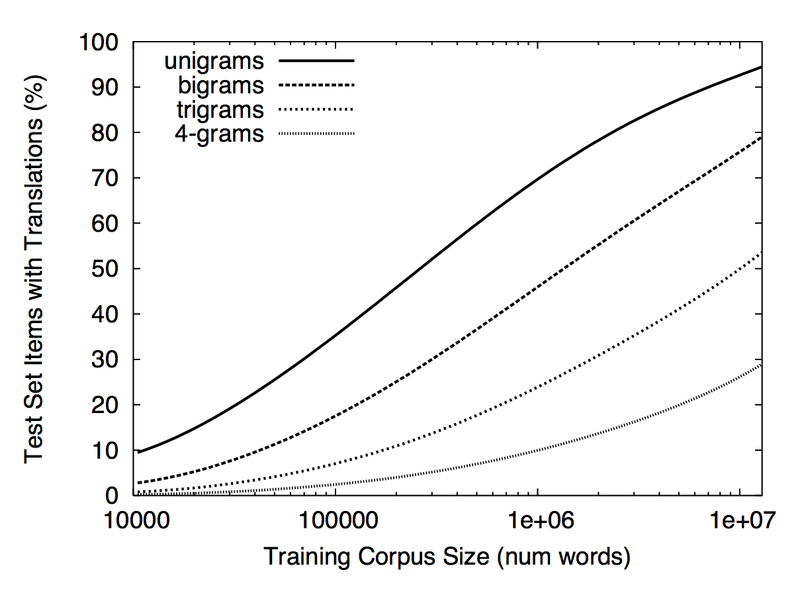 Figure 4: Learning curves showing the effects of increasing the size of dialectal training data, when combined with the 150M-word MSA parallel corpus, and when used alone. Adding the MSA training data is only useful when the dialectal data is scarce (200k words). Table 6: Results on a truly independent test set, consisting of data harvested from Egyptian Facebook pages that are entirely distinct from the our dialectal training set. The improvements over the MSA baseline are still considerable&colon; +2.9 BLEU points when no Facebook data is available for tuning and +2.7 with a Facebook tuning set. Table 7: A comparison of the effectiveness of performing Levantine-to-MSA mapping before translating into English, versus translating directly from Levantine into English. The mapping from Levantine to MSA was done manually, so it is an optimistic estimate of what might be done automatically. Although initially helpful to the MSA baseline system, the usefulness of pivoting through MSA drops as more dialectal data is added, eventually hurting performance. Recent work has established the efficacy of Amazon's Mechanical Turk for constructing parallel corpora for machine translation research. We apply this to building a collection of parallel corpora between English and six languages from the Indian subcontinent&colon; Bengali, Hindi, Malayalam, Tamil, Telugu, and Urdu. These languages are low-resource, under-studied, and exhibit linguistic phenomena that are difficult for machine translation. We conduct a variety of baseline experiments and analysis, and release the data to the community. Abstract: Recent work has established the efficacy of Amazon's Mechanical Turk for constructing parallel corpora for machine translation research. We apply this to building a collection of parallel corpora between English and six languages from the Indian subcontinent&colon; Bengali, Hindi, Malayalam, Tamil, Telugu, and Urdu. These languages are low-resource, under-studied, and exhibit linguistic phenomena that are difficult for machine translation. We conduct a variety of baseline experiments and analysis, and release the data to the community. Figure 1: An example of SOV word ordering in Tamil. Translation&colon; The senator prepared her remarks. Figure 2: An example of the morphology of the Bengali word হাত্সিলাম, meaning [I] was walking. CONT denotes the continuous aspect, while PAST denotes past tense. Table 3: Dictionary statistics. Entries is the number of source-language types, while translations lists the number of words or phrases they translated to (i.e., the number of pairs in the dictionary). Controls for Hindi were obtained using Google translate, the only one of these languages that were available at the outset of this project. Figure 3: The total volume of translations (measured in English words) as a function of elapsed days. 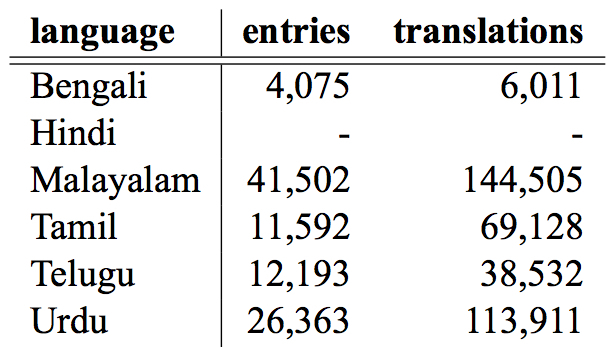 For Malayalam, we collected half a million words of translations in just under a week. Table 5: BLEU scores translating into English (four references). BLEU scores are the mean of three MERT runs. Table 6: Some example translations. Table 7: BLEU scores translating into English on a quarter of the training data (plus dictionary), selected in two ways&colon; best (result of vote), and random. There is little difference, suggesting quality control may not be terribly important. We did not collect votes for Malayalam. 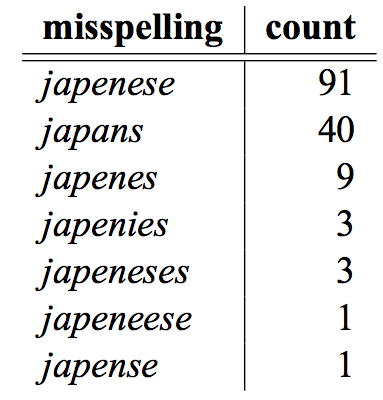 Table 8: Misspellings of japanese (947) in the training portion of the Urdu-English data, along with their counts. 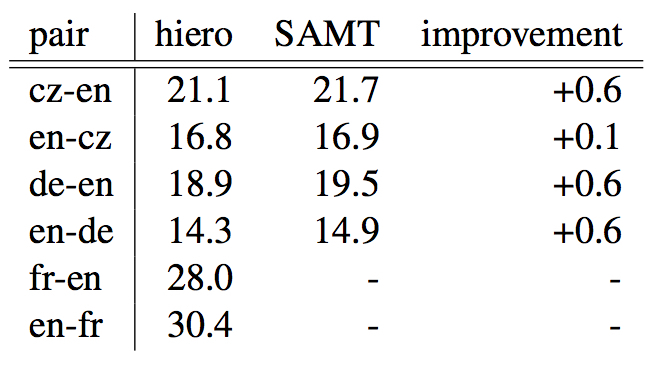 Table 9: Hiero translation results using Berkeley align- ments instead of GIZA++ heuristics. The gain columns denotes improvements relative to the Hiero systems in Ta- ble 5. In many cases (bold gains), the BLEU scores are at or above even the SAMT models from that table. Abstract: We present progress on Joshua, an open source decoder for hierarchical and syntax-based machine translation. The main focus is describing Thrax, a flexible, open source synchronous context-free grammar extractor. Thrax extracts both hierarchical (Chiang, 2007) and syntax-augmented machine translation (Zollmann and Venugopal, 2006) grammars. It is built on Apache Hadoop for efficient distributed performance, and can easily be extended with support for new grammars, feature functions, and output formats. 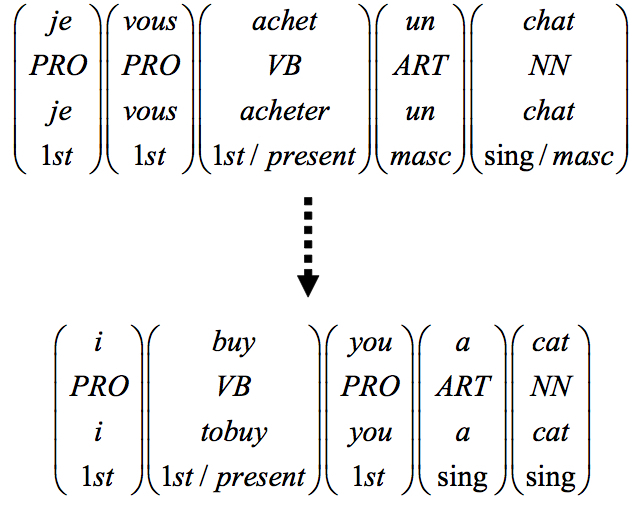 Figure 1: An aligned sentence pair. 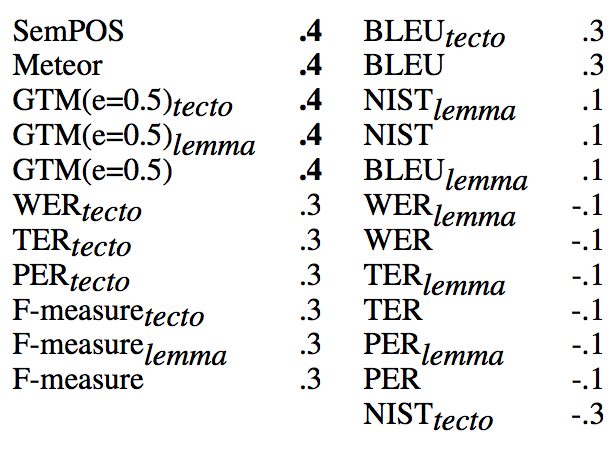 Table 1: A subset of the Hiero and SAMT rules extracted from the sentence pair of Figure 1. Table 2: Training data size after subsampling. Table 3: Single-reference BLEU-4 scores. Figure 2: An SAMT derivation. The shaded terminal symbols are the lexicalized part of a rule with terminals and non-terminals. The unshaded terminals are directly dominated by a nonterminal symbol. Previous work has shown that high quality phrasalparaphrases can be extracted from bilingual parallel corpora. However, it is not clear whether bitexts are an appropriate resource for extracting more sophisticated sentential paraphrases, which are more obviously learnable from monolingual parallel corpora. We extend bilingual paraphrase extraction to syntactic paraphrases and demonstrate its ability to learn a variety of general paraphrastic transformations, including passivization, dative shift, and topicalization. We discuss how our model can be adapted to many text generation tasks by augmenting its feature set, development data, and parameter estimation routine. We illustrate this adaptation by using our paraphrase model for the task of sentence compression and achieve results competitive with state-of-the-art compression systems. Abstract: Previous work has shown that high quality phrasalparaphrases can be extracted from bilingual parallel corpora. However, it is not clear whether bitexts are an appropriate resource for extracting more sophisticated sentential paraphrases, which are more obviously learnable from monolingual parallel corpora. We extend bilingual paraphrase extraction to syntactic paraphrases and demonstrate its ability to learn a variety of general paraphrastic transformations, including passivization, dative shift, and topicalization. We discuss how our model can be adapted to many text generation tasks by augmenting its feature set, development data, and parameter estimation routine. We illustrate this adaptation by using our paraphrase model for the task of sentence compression and achieve results competitive with state-of-the-art compression systems. 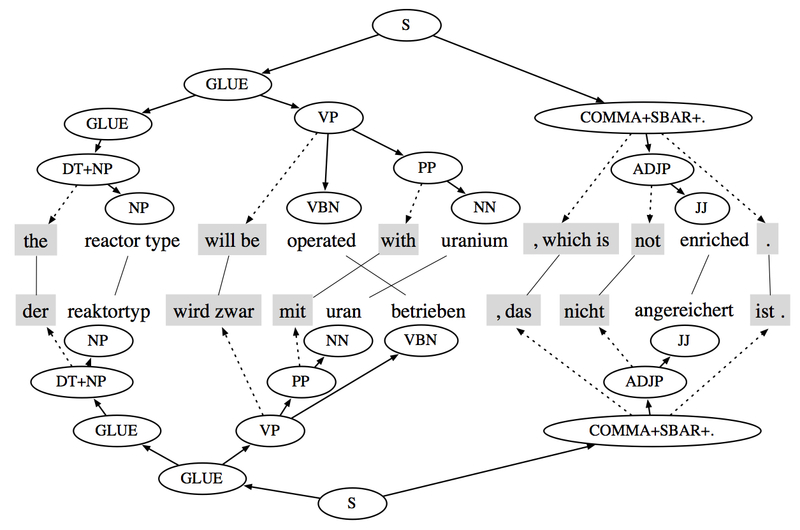 Figure 1: Synchronous grammar rules for translation are extracted from sentence pairs in a bixtext which have been automatically parsed and word-aligned. 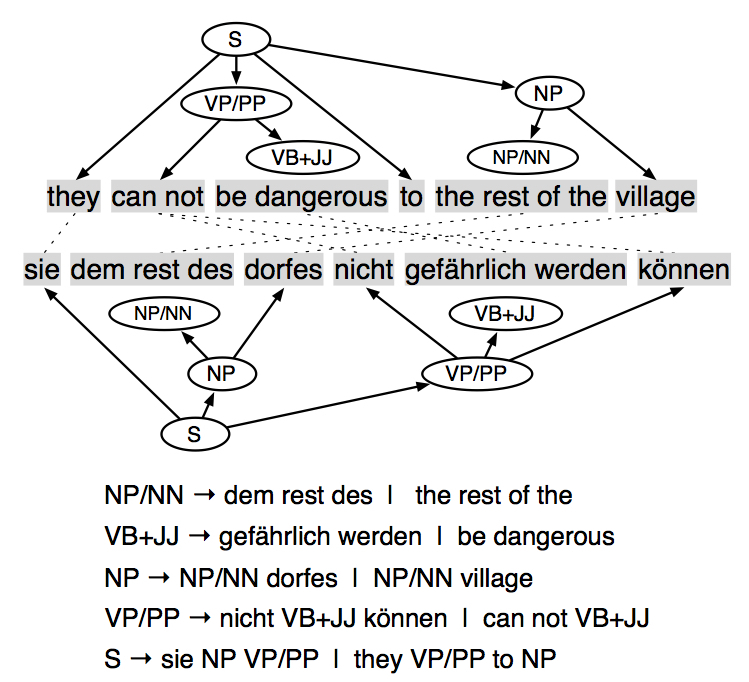 Extraction methods vary on whether they extract only minimal rules for phrases dominated by nodes in the parse tree, or more complex rules that include non-constituent phrases. Figure 2: An example derivation produced by a syntactic machine translation system. 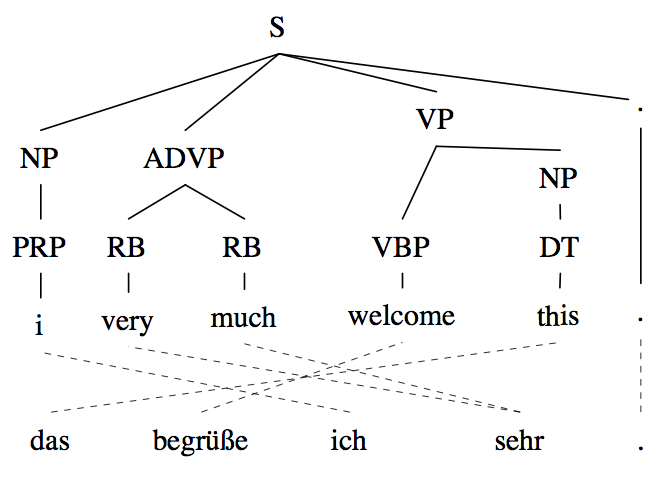 Although the synchronous trees are unlike the derivations found in the Penn Treebank, their yield is a good translation of the German. Figure 3: An example of a synchronous paraphrastic derivation. A few of the rules applied in the parse are show in the left column, with the pivot phrases that gave rise to them on the right. Table 1: A selection of meaning-preserving transformations and hand-picked examples of syntactic paraphrases that our system extracts capturing these. Table 2: Number and distribution of rules in our para- phrase grammar. Note the significant number of identity paraphrases and rules with complex nonterminal labels. Table 4: Human evaluation for shorter compressions and for variations of our paraphrase system. +Feat. includes the compression features from Section 6.1, +Aug. includes optional deletion rules from Section 6.4. Table 3: Results of the human evaluation on longer compressions&colon; pairwise compression rates (CR), meaning and grammaticality scores. Bold indicates a statistically significance difference at p < 0.05. Table 5: Example compressions produced by the two systems in Table 3 for three input sentences from our test data. Abstract: Naively collecting translations by crowdsourcing the task to non-professional translators yields disfluent, low-quality results if no quality control is exercised. We demonstrate a variety of mechanisms that increase the translation quality to near professional levels. Specifically, we solicit redundant translations and edits to them, and automatically select the best output among them. We propose a set of features that model both the translations and the translators, such as country of residence, LM perplexity of the translation, edit rate from the other translations, and (optionally) calibration against professional translators. Using these features to score the collected translations, we are able to discriminate between acceptable and unacceptable translations. We recreate the NIST 2009 Urdu-toEnglish evaluation set with Mechanical Turk, and quantitatively show that our models are able to select translations within the range of quality that we expect from professional translators. The total cost is more than an order of magnitude lower than professional translation. Figure 1: A comparison of professional translations provided by the LDC to non-professional translations created on Mechanical Turk. 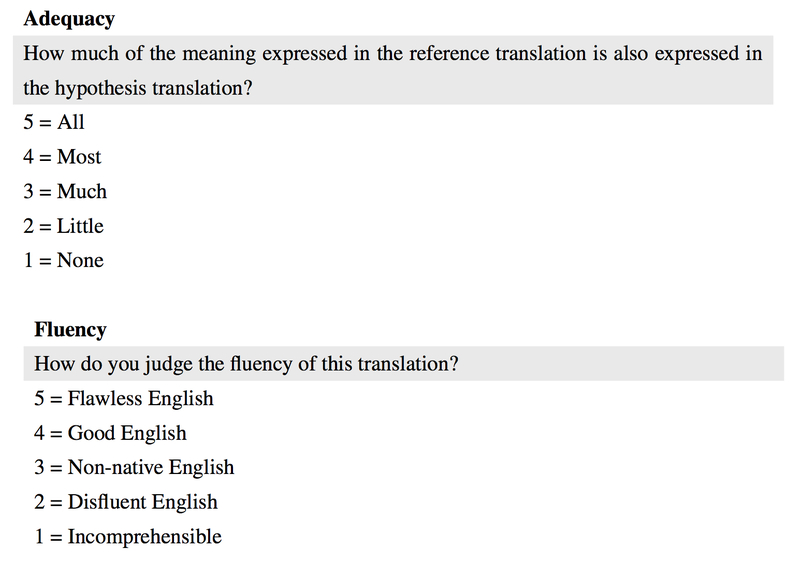 Figure 2: We redundantly translate each source sentence by soliciting multiple translations from different Turkers. These translations are put through a subsequent editing set, where multiple edited versions are produced. We select the best translation from the set using features that predict the quality of each translation and each translator. 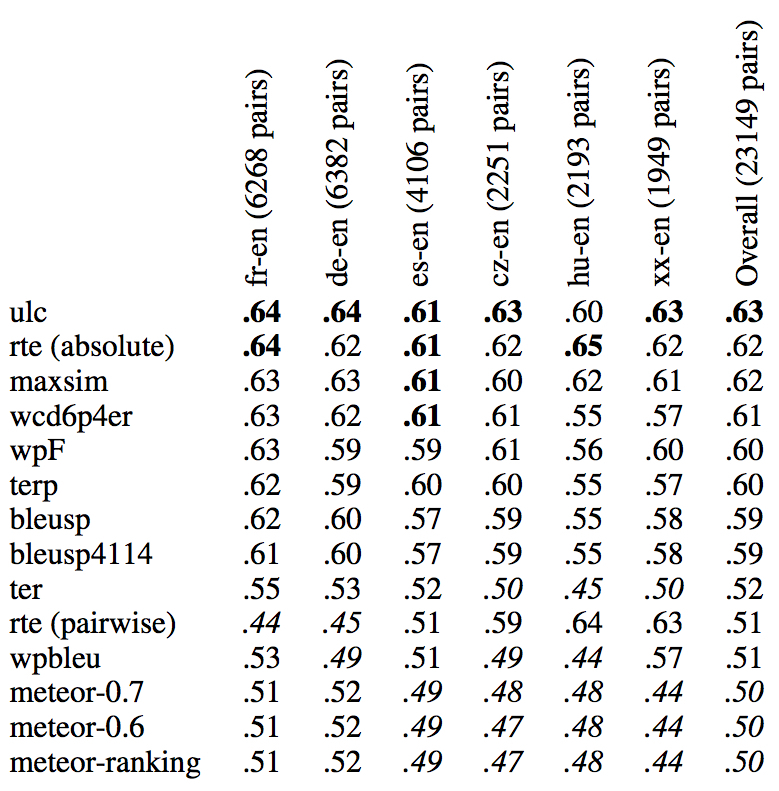 Figure 3: BLEU scores for different selection methods, measured against the reference sets. 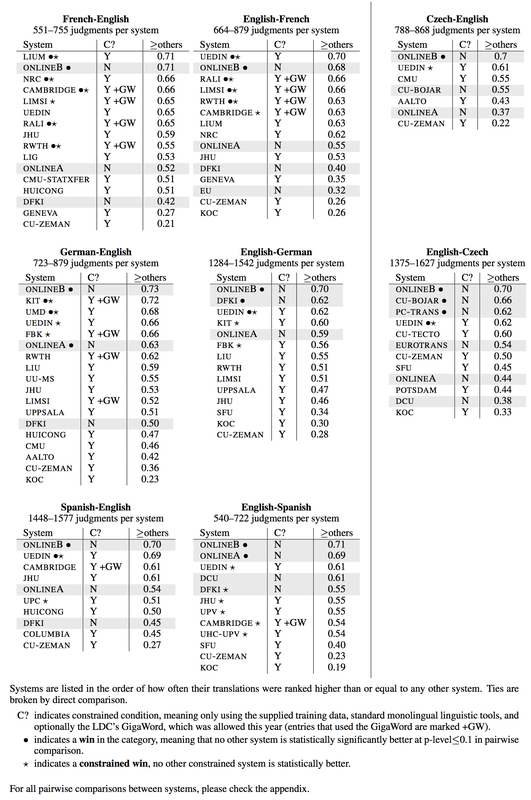 Each score is an average of four BLEU scores, each calculated against three LDC reference translations. The five right-most bars are colored in orange to indicate selection over a set that includes both original translations as well as edited versions of them. Table 1: Correlation (± std. dev.) for different selection methods, compared against the reference sets. Figure 4: BLEU scores for the five right-most setups from Figure 3, constrained over the original translations. Figure 5: The effect of varying the amount of calibration data (and using only the calibration feature). The 10% point (BLEU = 37.82) and the dashed line (BLEU = 39.06) correspond to the two right-most bars of Figure 3. Abstract: The written form of Arabic, Modern Standard Arabic (MSA), differs quite a bit from the spoken dialects of Arabic, which are the true “native” languages of Arabic speakers used in daily life. However, due to MSA’s prevalence in written form, almost all Arabic datasets have predominantly MSA content. 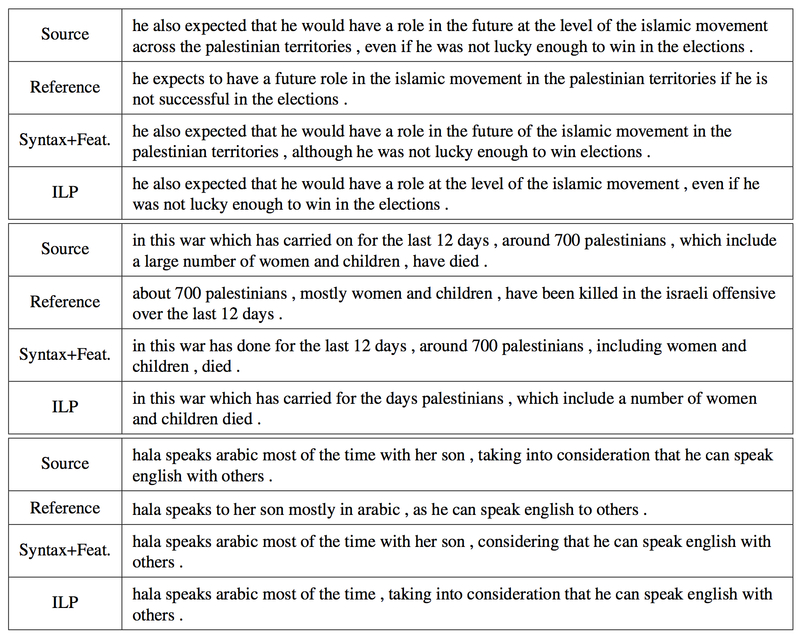 We present the Arabic Online Commentary Dataset, a 52M-word monolingual dataset rich in dialectal content, and we describe our long-term annotation effort to identify the dialect level (and dialect itself) in each sentence of the dataset. So far, we have labeled 108K sentences, 41% of which as having dialectal content. We also present experimental results on the task of automatic dialect identification, using the collected labels for training and evaluation. Table 1: A summary of the different components of the AOC dataset. 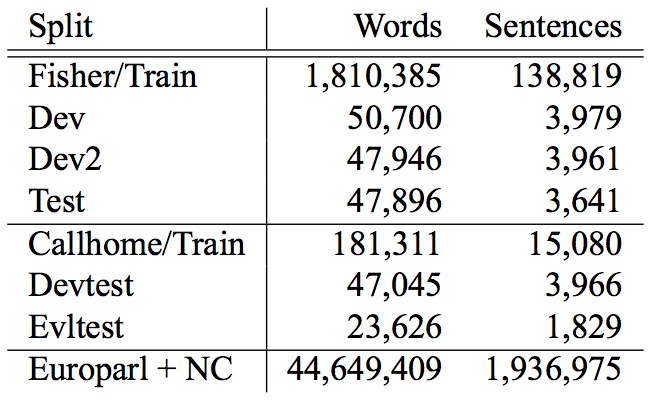 Overall, 1.4M comments were harvested from 86.1K articles, corresponding to 52.1M words. Table 2: A breakdown of sentences for which ≥ 2 annotators agreed on whether dialectal content exists or not. 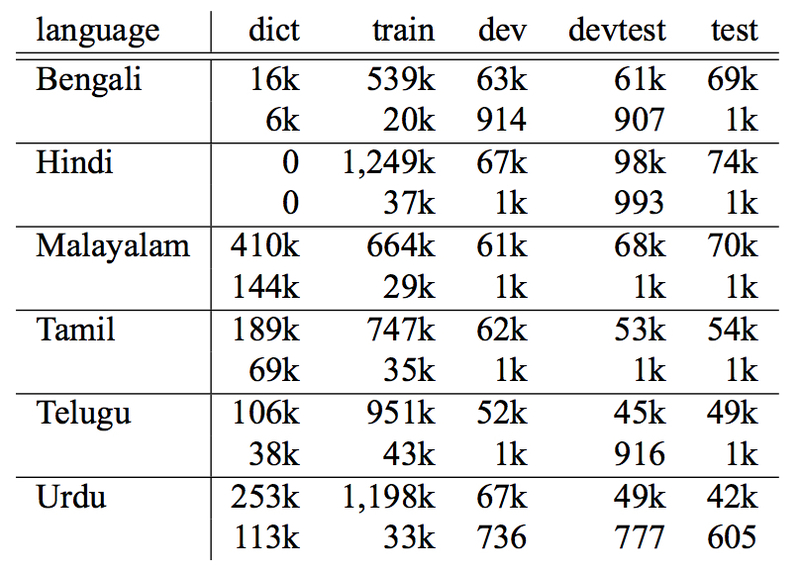 Table 3: Accuracy, dialect precision, and dialect recall (10-fold cross validation) for various classification tasks. 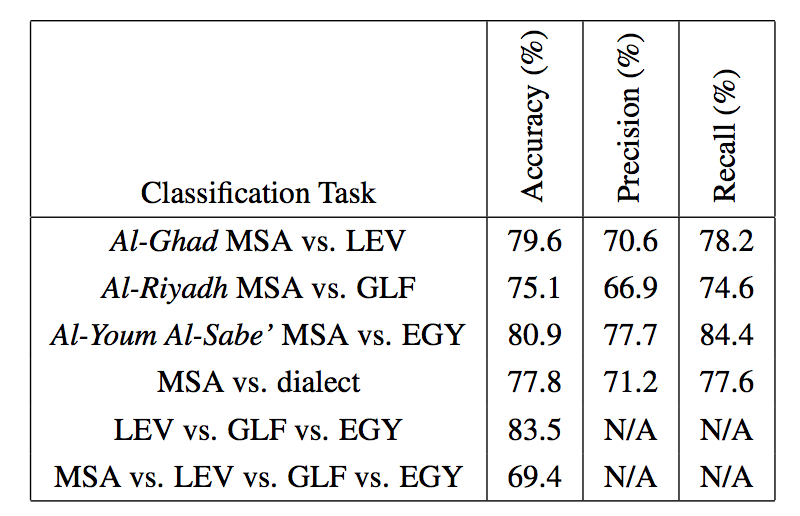 Figure 3: Dialect precision vs. recall for the classification task over Al-Ghad sentences (MSA vs. Levantine). The square point corresponds to the first line in Table 3. We describe the progress we have made in the past year on Joshua (Li et al., 2009a), an open source toolkit for parsing-based machine translation. The new functionality includes&colon; support for translation grammars with a rich set of syntactic nonterminals, the ability for external modules to posit constraints on how spans in the input sentence should be translated, lattice parsing for dealing with input uncertainty, a semiring framework that provides a unified way of doing various dynamic programming calculations, variational decoding for approximating the intractable MAP decoding, hypergraph-based discriminative training for better feature engineering, a parallelized MERT module, document-level and tail-based MERT, visualization of the derivation trees, and a cleaner pipeline for MT experiments. Abstract: We describe a unified and coherent syntactic framework for supporting a semantically-informed syntactic approach to statistical machine translation. 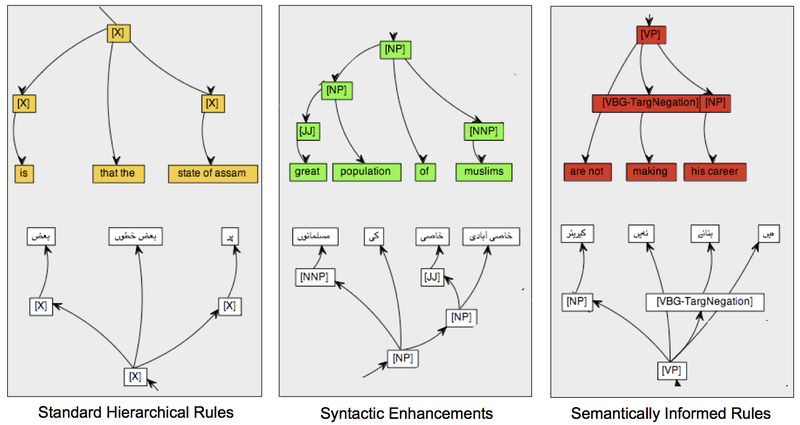 Semantically enriched syntactic tags assigned to the target-language training texts improved translation quality. 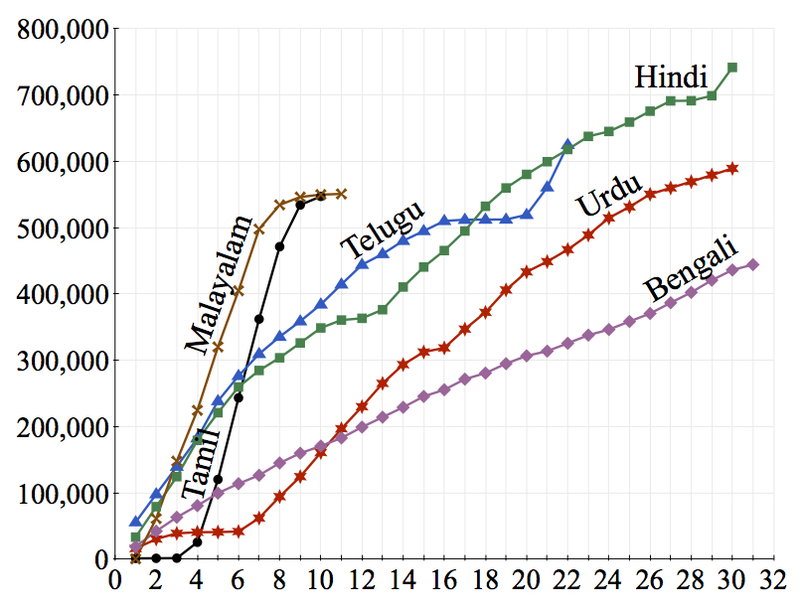 The resulting system significantly outperformed a linguistically naive baseline model (Hiero), and reached the highest scores yet reported on the NIST 2009 Urdu-English translation task. 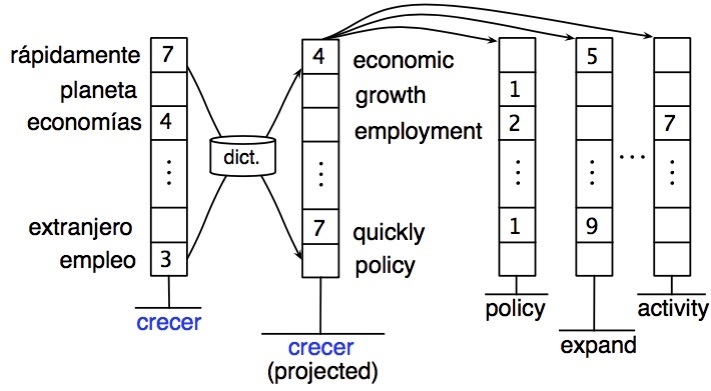 This finding supports the hypothesis (posed by many researchers in the MT community, e.g., in DARPA GALE) that both syntactic and semantic information are critical for improving translation quality—and further demonstrates that large gains can be achieved for low-resource languages with different word order than English. Figure 1: An example of Urdu-English translation. 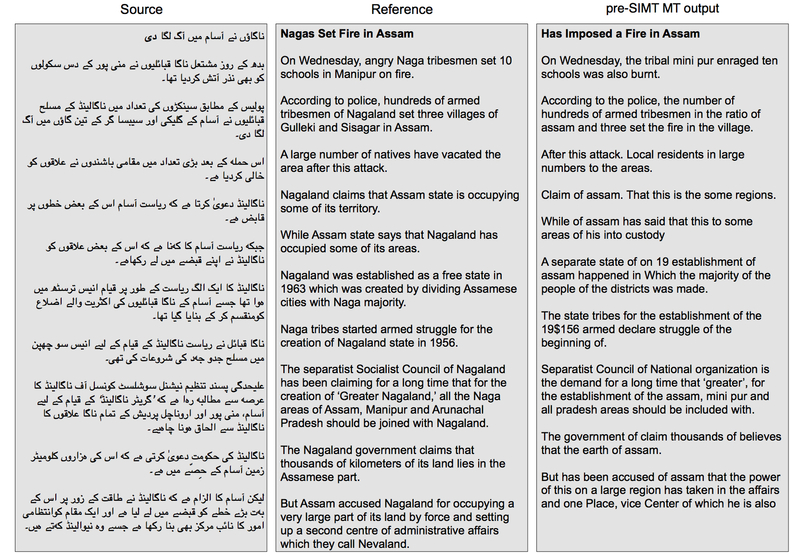 Shown are an Urdu source document, a reference translation produced by a professional human translator, and machine translation output from a phrase-based model (Moses) without linguistic information, which is representative of state-of-the-art MT quality before the SIMT effort. Figure 2: The evolution of a semantically informed approach to our synchronous context free grammars (SCFGs). At the start of summer the decoder used translation rules with a single generic non-terminal symbol, later syntactic categories were used, and by the end of the summer the translation rules included semantic elements such as named entities and modalities. Table 1: The size of the various data sets used for the experiments in this paper including the training, development (dev), incremental test set (devtest) and blind test set (test). The dev/devtest was a split of the NIST08 Urdu-English test set, and the blind test set was NIST09. Figure 4: A sentence on the English side of the bilingual parallel training corpus is parsed with a syntactic parser, and also tagged with a named entity tagger. The tags are then grafted onto the syntactic parse tree to form new categories like NP-GPE and NP-weapon. Grafting happens prior to extracting translation rules, which happens normally except for the use of the augmented trees. 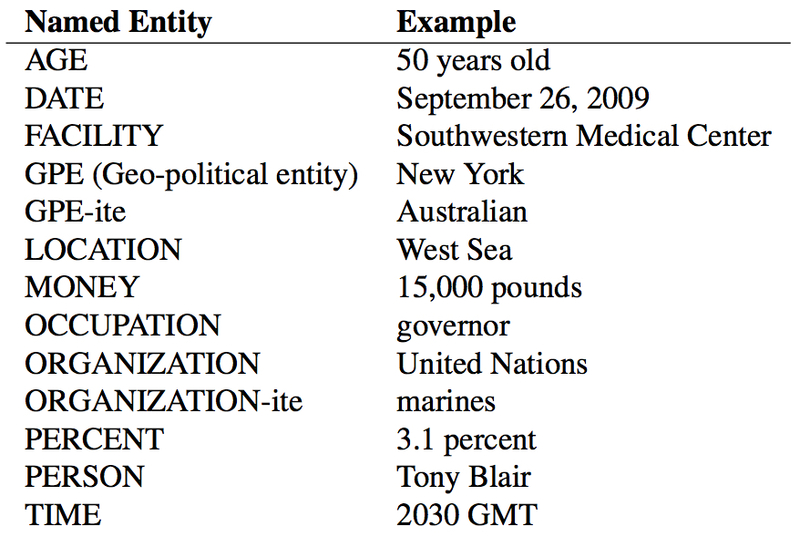 Figure 5: Example translation rules with named entity tags and modalities combined with syntactic categories. Figure 6: Results for a range of experiments conducted during the SIMT effort. 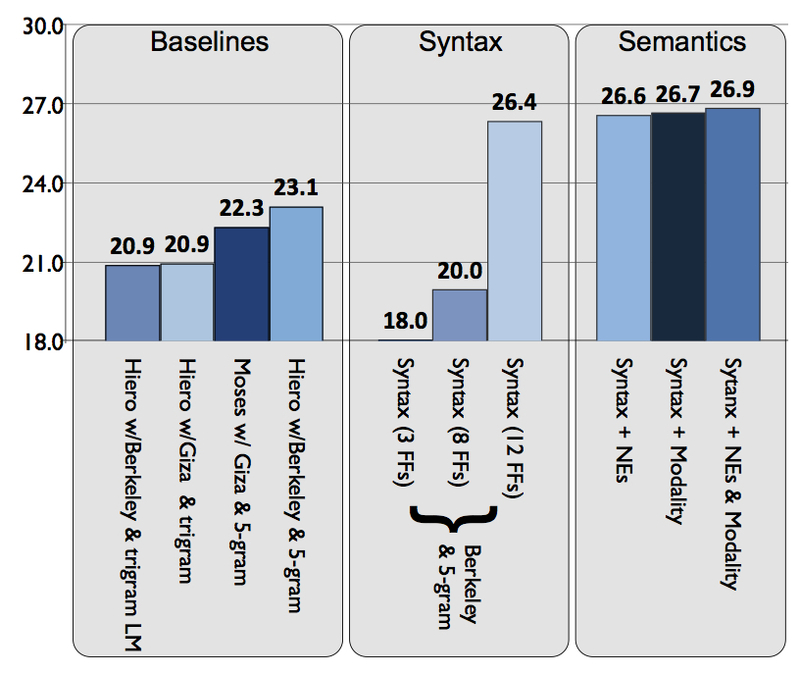 Results show scores for base- line systems, which here include a phrase-based model (Moses) and a hierarchical phrase-based model (Hiero), neither of which make use of syntactic information. These also show the substantial improvements when syn- tax is introduced, along with different numbers of feature functions (FFs), and further improvements from semantic elements. The scores are lowercased Bleu calculated on the held-out devtest set. 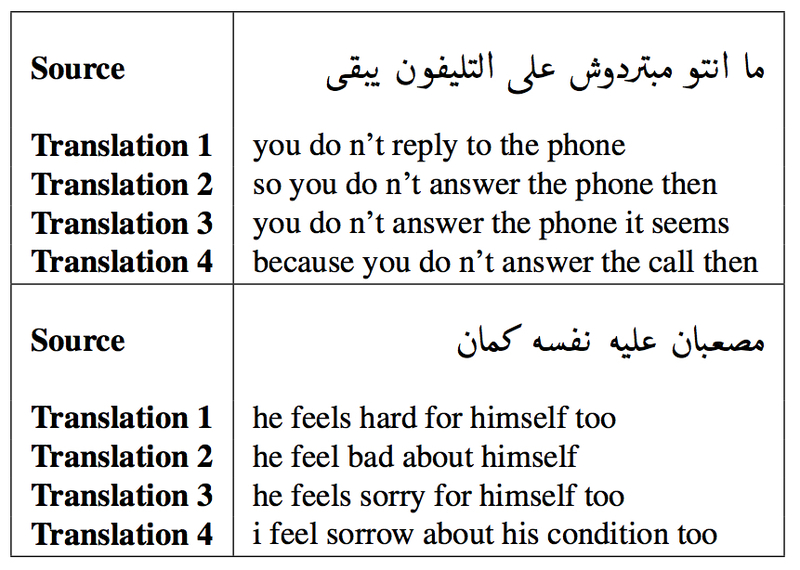 Figure 7: An example of the improvements to Urdu-English translation before and after the SIMT effort. Output is from the baseline Hiero model, which does not use linguistic information, and from the final model, which incorporates syntactic and semantic information. Abstract: In this paper we give an introduction to using Amazon's Mechanical Turk crowdsourcing platform for the purpose of collecting data for human language technologies. We survey the papers published in the NAACL2010 Workshop. 24 researchers participated in the workshop's $100 challenge to create data for speech and language applications. Figure 1: Time spent, HITs completed, and amount earned from a survey of 1,000 Turkers by Ipeirotis (2010). Abstract: This paper presents the results of the WMT10 and MetricsMATR10 shared tasks,1 which included a translation task, a system combination task, and an evaluation task. We conducted a large-scale manual evaluation of 104 machine translation systems and 41 system combination entries. 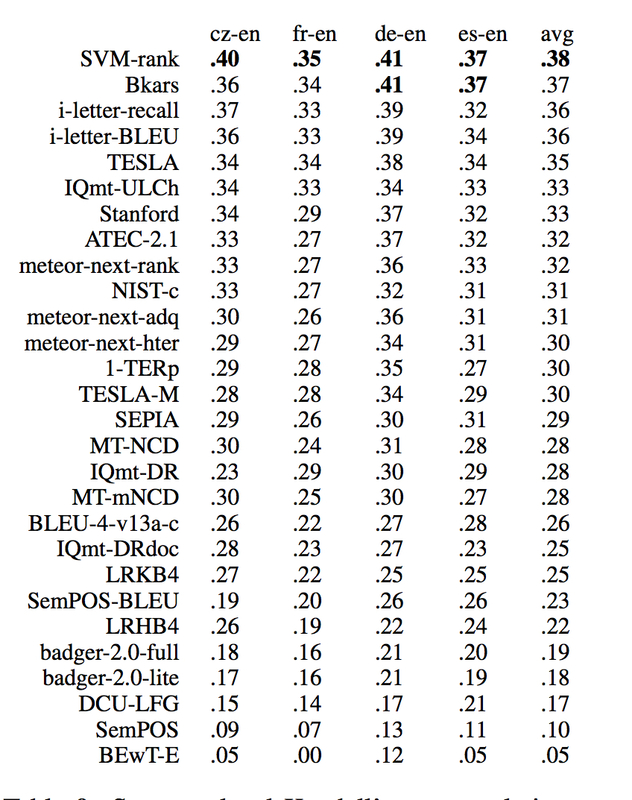 We used the ranking of these systems to measure how strongly automatic metrics correlate with human judgments of translation quality for 26 metrics. This year we also investigated increasing the number of human judgments by hiring non-expert annotators through Amazon’s Mechanical Turk. Figure 1: Statistics for the training and test sets used in the translation task. The number of words and the number of distinct words is based on the provided tokenizer. Table 1: Participants in the shared translation task. Not all groups participated in all language pairs. Table 2: Participants in the system combination task. Table 3: The number of items that were collected for each task during the manual evaluation. An item is defined to be a rank label in the ranking task, an edited sentence in the editing task, and a yes/no judgment in the judgment task. 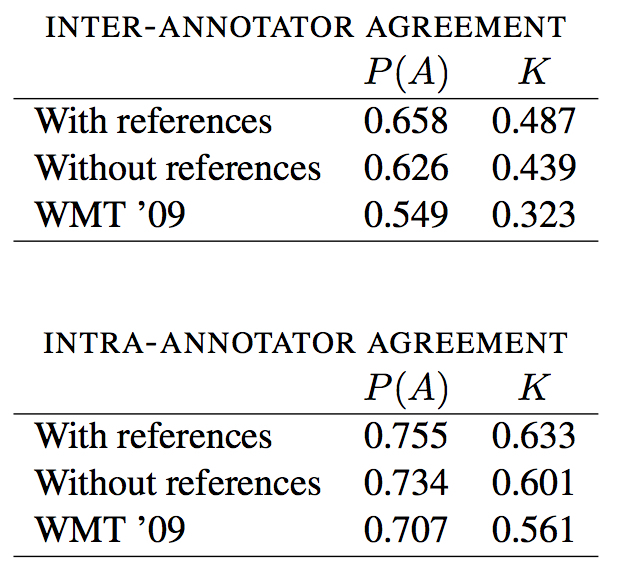 Table 4: Inter- and intra-annotator agreement for the sentence ranking task. In this task, P(E) is 0.333. Figure 2: This screenshot shows what an annotator sees when beginning to edit the output of a machine translation system. Figure 3: The percent of time that each system’s edited output was judged to be an acceptable translation. These numbers also include judgments of the system’s output when it was marked either incomprehen- sible or acceptable and left unedited. Note that the reference translation was edited alongside the system outputs. Error bars show one positive and one negative standard deviation for the systems in that lan- guage pair. 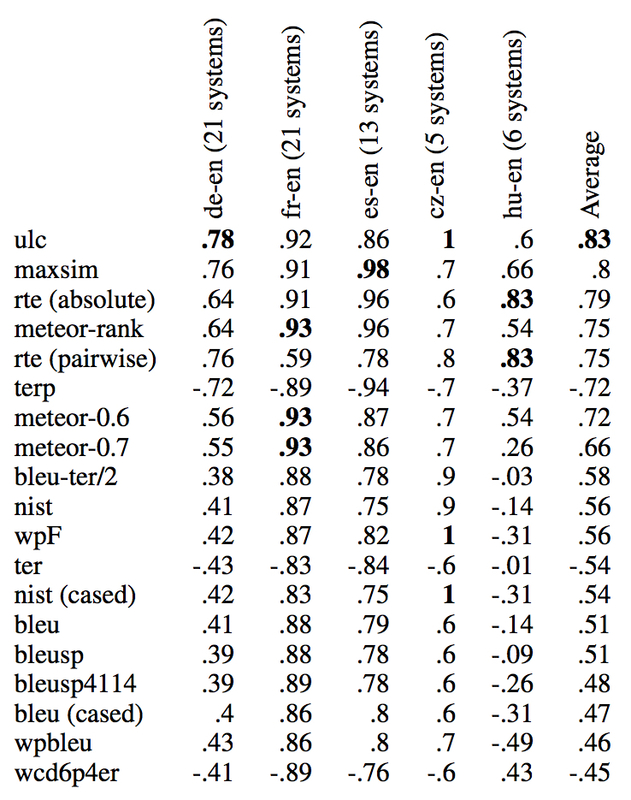 Table 7: System-level Spearman’s rho correlation of the automatic evaluation metrics with the human judgments for translation into English, ordered by average absolute value. Table 9: Segment-level Kendall’s tau correlation of the automatic evaluation metrics with the human judgments for translation into English, ordered by average absolute value. Number of pairs included in comparison&colon; cz-en 3575, fr-en 5844, de-en 7585, es-en 7911. 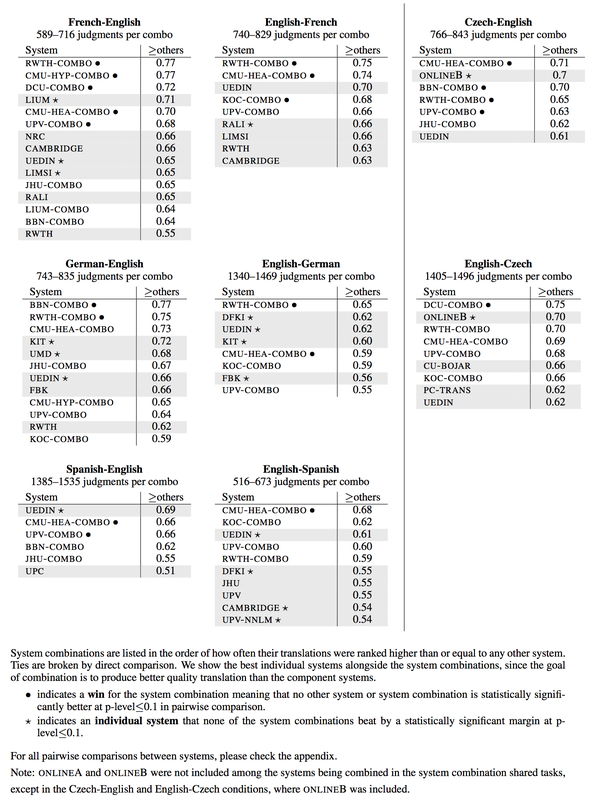 Table 8: System-level Spearman’s rho correlation of the automatic evaluation metrics with the human judgments for translation out of English, ordered by average absolute value. 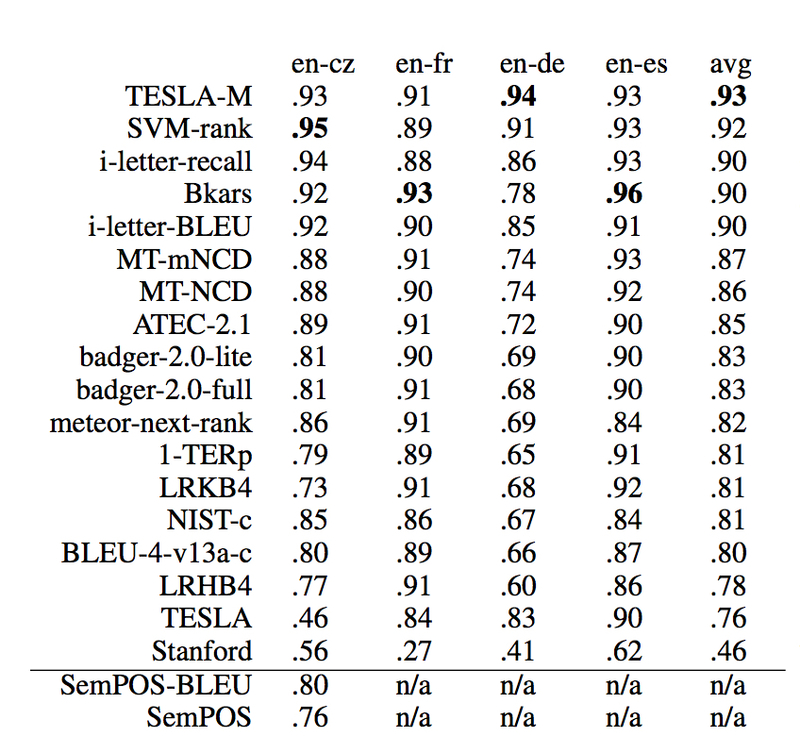 Table 10: Segment-level Kendall’s tau correlation of the automatic evaluation metrics with the human judgments for translation out of English, ordered by average absolute value. Number of pairs included in comparison&colon; en-cz 9613, en-fr 5904, en-de 10892, en-es 3813. Table 11: Statistics for data collected on MTurk for the ranking task. In total, 55,082 rank labels were collected across the eight language pairs (145% of expert data). Each language pair had 600 sets, and we requested each set completed by 5 different workers. Since each set provides 5 labels, we could have potentially obtained 600 _ 5 _ 5 = 15,000 labels for each language pair. The Label count row indicates to what extent that potential was met (over the 30-day lifetime of our tasks), and the “Completed...” rows give a breakdown of redundancy. For instance, the right-most column indicates that, in the cz-en group, 2.0% of the 600 sets were completed by only one worker, while 67% of the sets were completed by 5 workers, with 100% of the sets completed at least once. The total cost of this data collection effort was roughly $200. 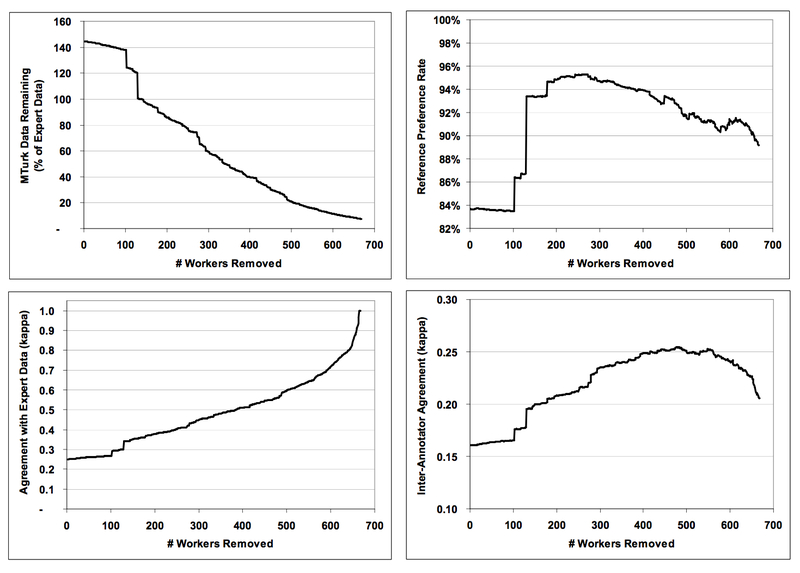 Figure 4: The effect of removing an increasing number of MTurk workers. The order in which workers are removed is by Kexp(w), the kappa agreement coefficient with expert data (excluding references). We describe Joshua, an open source toolkit for statistical machine translation. Joshua implements all of the algorithms required for synchronous context free grammars (SCFGs)&colon; chart-parsing, ngram language model integration, beamand cube-pruning, and k-best extraction. The toolkit also implements suffix-array grammar extraction and minimum error rate training. It uses parallel and distributed computing techniques for scalability. 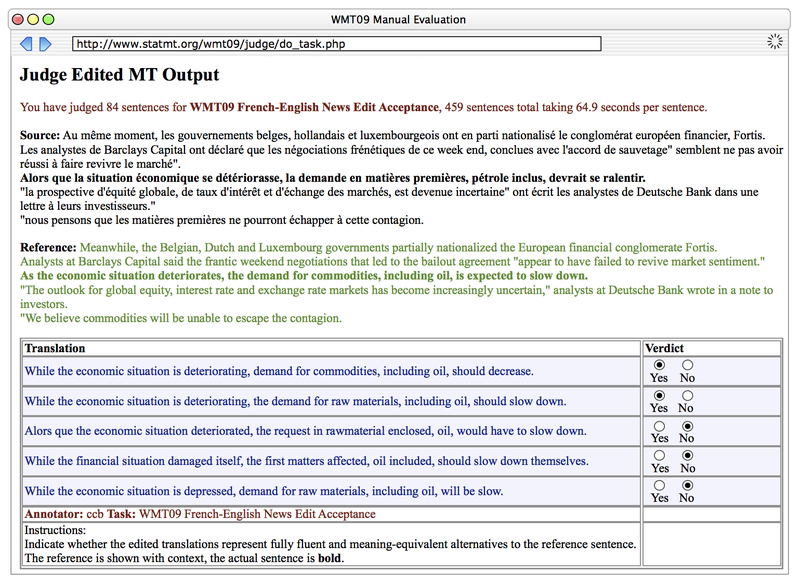 We demonstrate that the toolkit achieves state of the art translation performance on the WMT09 French-English translation task. Abstract: We describe Joshua, an open source toolkit for statistical machine translation. 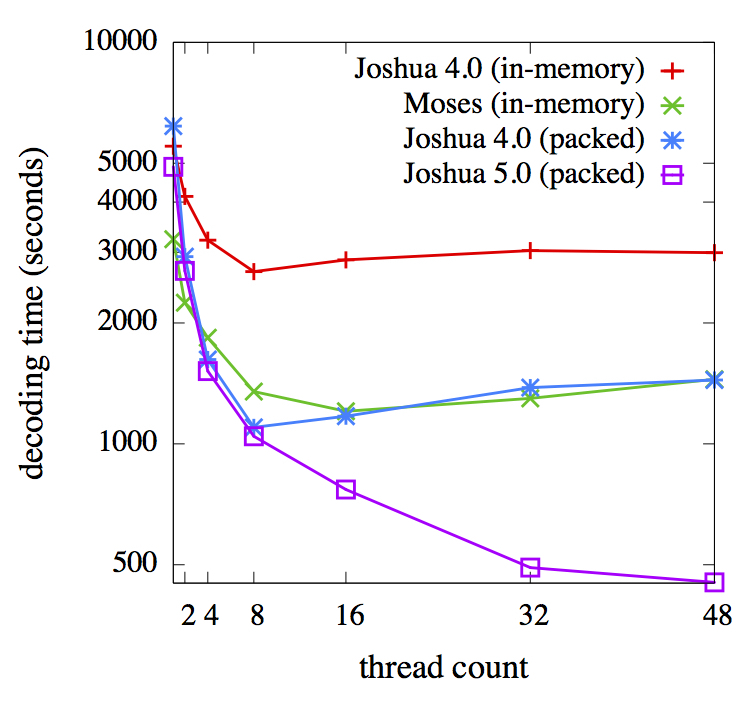 Joshua implements all of the algorithms required for synchronous context free grammars (SCFGs)&colon; chart-parsing, ngram language model integration, beamand cube-pruning, and k-best extraction. The toolkit also implements suffix-array grammar extraction and minimum error rate training. It uses parallel and distributed computing techniques for scalability. We demonstrate that the toolkit achieves state of the art translation performance on the WMT09 French-English translation task. Table 1: The uncased BLEU scores on WMT-09 French-English Task. The test set consists of 2525 segments, each with one reference translation. Abstract: This paper presents the results of the WMT09 shared tasks, which included a translation task, a system combination task, and an evaluation task. We conducted a large-scale manual evaluation of 87 machine translation systems and 22 system combination entries. We used the ranking of these systems to measure how strongly automatic metrics correlate with human judgments of translation quality, for more than 20 metrics. We present a new evaluation technique whereby system output is edited and judged for correctness. Figure 1: Statistics for the training and test sets used in the translation task. The number of words is based on the provided tokenizer and the number of distinct words is the based on lowercased tokens. Table 3: The number of items that were judged for each task during the manual evaluation. Figure 2: This screenshot shows an annotator editing the output of a machine translation system. 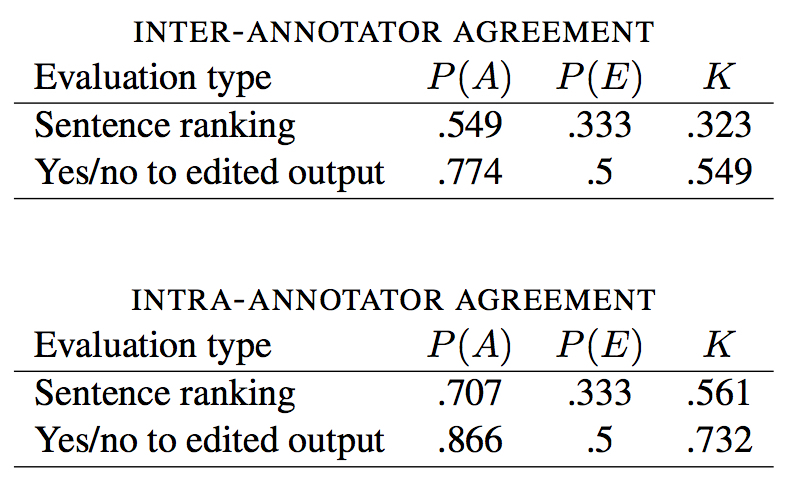 Figure 3: This screenshot shows an annotator judging the acceptability of edited translations. 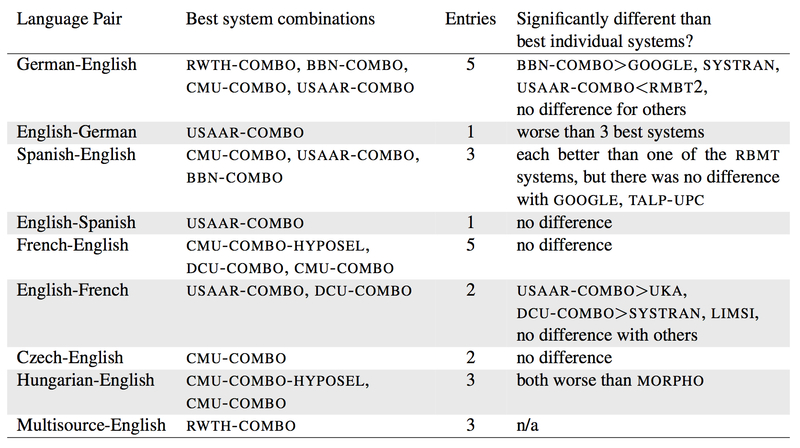 Table 5: A comparison between the best system combinations and the best individual systems. It was generally difficult to draw a statistically significant differences between the two groups, and between the combinations themselves. Figure 6: The percent of time that each system’s edited output was judged to be an acceptable translation. These numbers also include judgments of the system’s output when it was marked either incomprehensible or acceptable and left unedited. Note that the reference translation was edited alongside the system outputs. Error bars show one positive and one negative standard deviation for the systems in that language pair. Table 7: The system-level correlation of the automatic evaluation metrics with the human judgments for translation into English. Table 8: The system-level correlation of the automatic evaluation metrics with the human judgements for translation out of English. Abstract: We describe an open-source toolkit for statistical machine translation whose novel contributions are (a) support for linguistically motivated factors, (b) confusion network decoding, and (c) efficient data formats for translation models and language models. In addition to the SMT decoder, the toolkit also includes a wide variety of tools for training, tuning and applying the system to many translation tasks. Paraphrasing and translation have previously been treated as unconnected natural language processing tasks. Whereas translation represents the preservation of meaning when an idea is rendered in the words in a different language, paraphrasing represents the preservation of meaning when an idea is expressed using different words in the same language. We show that the two are intimately related. The major contributions of this thesis are as follows&colon;We define a novel technique for automatically generating paraphrases using bilingual parallel corpora, which are more commonly used as training data for statistical models of translation.We show that paraphrases can be used to improve the quality of statistical machine translation by addressing the problem of coverage and introducing a degree of generalization into the models.We explore the topic of automatic evaluation of translation quality, and show that the current standard evaluation methodology cannot be guaranteed to correlate with human judgments of translation quality.Whereas previous data-driven approaches to paraphrasing were dependent upon either data sources which were uncommon such as multiple translation of the same source text, or language specific resources such as parsers, our approach is able to harness more widely parallel corpora and can be applied to any language which has a parallel corpus. The technique was evaluated by replacing phrases with their paraphrases, and asking judges whether the meaning of the original phrase was retained and whether the resulting sentence remained grammatical. Paraphrases extracted from a parallel corpus with manual alignments are judged to be accurate (both meaningful and grammatical) 75% of the time, retaining the meaning of the original phrase 85% of the time. Using automatic alignments, meaning can be retained at a rate of 70%.Being a language independent and probabilistic approach allows our method to be easily integrated into statistical machine translation. 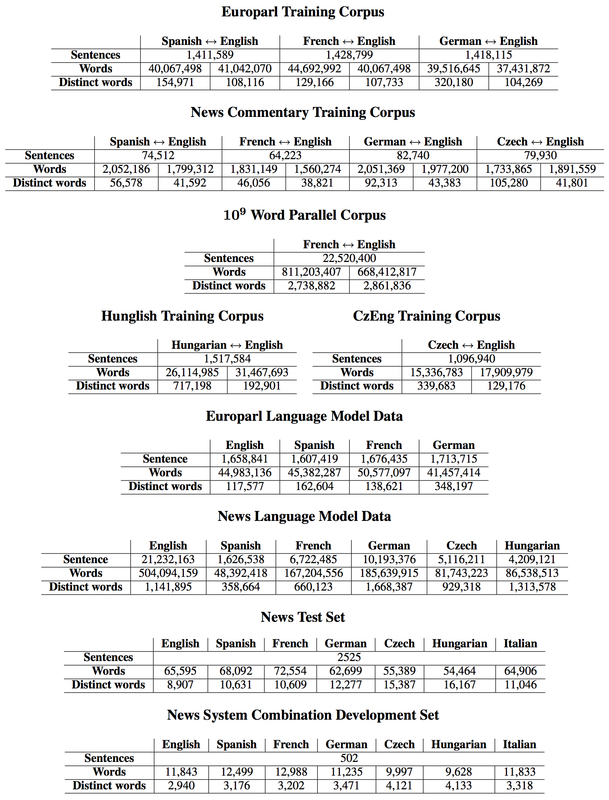 A paraphrase model derived from parallel corpora other than the one used to train the translation model can be used to increase the coverage of statistical machine translation by adding translations of previously unseen words and phrases. If the translation of a word was not learned, but a translation of a synonymous word has been learned, then the word is paraphrased and its paraphrase is translated. Phrases can be treated similarly. Results show that augmenting a state-of-the-art SMT system with paraphrases in this way leads to significantly improved coverage and translation quality. For a training corpus with 10,000 sentence pairs, we increase the coverage of unique test set unigrams from 48% to 90%, with more than half of the newly covered items accurately translated, as opposed to none in current approaches. Abstract: Paraphrasing and translation have previously been treated as unconnected natural language processing tasks. Whereas translation represents the preservation of meaning when an idea is rendered in the words in a different language, paraphrasing represents the preservation of meaning when an idea is expressed using different words in the same language. We show that the two are intimately related. The major contributions of this thesis are as follows&colon;We define a novel technique for automatically generating paraphrases using bilingual parallel corpora, which are more commonly used as training data for statistical models of translation.We show that paraphrases can be used to improve the quality of statistical machine translation by addressing the problem of coverage and introducing a degree of generalization into the models.We explore the topic of automatic evaluation of translation quality, and show that the current standard evaluation methodology cannot be guaranteed to correlate with human judgments of translation quality.Whereas previous data-driven approaches to paraphrasing were dependent upon either data sources which were uncommon such as multiple translation of the same source text, or language specific resources such as parsers, our approach is able to harness more widely parallel corpora and can be applied to any language which has a parallel corpus. The technique was evaluated by replacing phrases with their paraphrases, and asking judges whether the meaning of the original phrase was retained and whether the resulting sentence remained grammatical. Paraphrases extracted from a parallel corpus with manual alignments are judged to be accurate (both meaningful and grammatical) 75% of the time, retaining the meaning of the original phrase 85% of the time. Using automatic alignments, meaning can be retained at a rate of 70%.Being a language independent and probabilistic approach allows our method to be easily integrated into statistical machine translation. 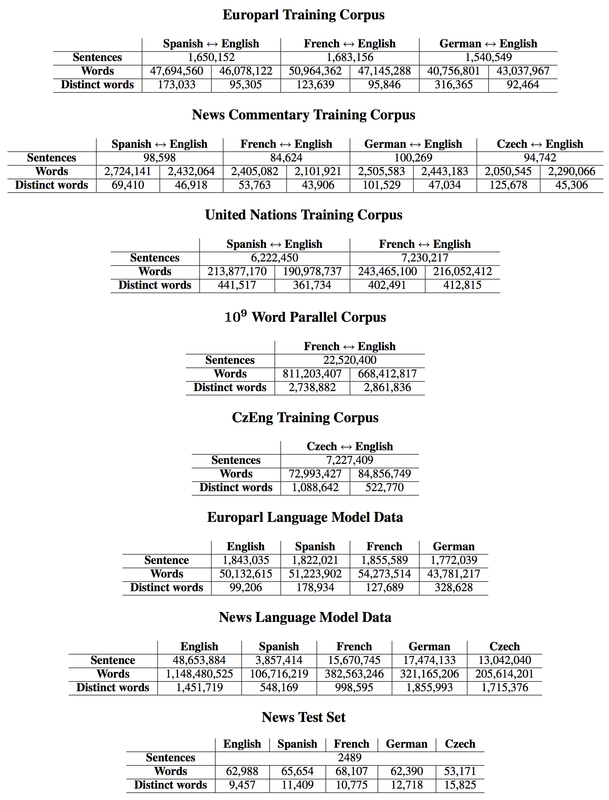 A paraphrase model derived from parallel corpora other than the one used to train the translation model can be used to increase the coverage of statistical machine translation by adding translations of previously unseen words and phrases. If the translation of a word was not learned, but a translation of a synonymous word has been learned, then the word is paraphrased and its paraphrase is translated. Phrases can be treated similarly. Results show that augmenting a state-of-the-art SMT system with paraphrases in this way leads to significantly improved coverage and translation quality. For a training corpus with 10,000 sentence pairs, we increase the coverage of unique test set unigrams from 48% to 90%, with more than half of the newly covered items accurately translated, as opposed to none in current approaches. Figure 1: The Spanish word cada ́veres can be used to discover that the English phrase dead bodies can be paraphrased as corpses. 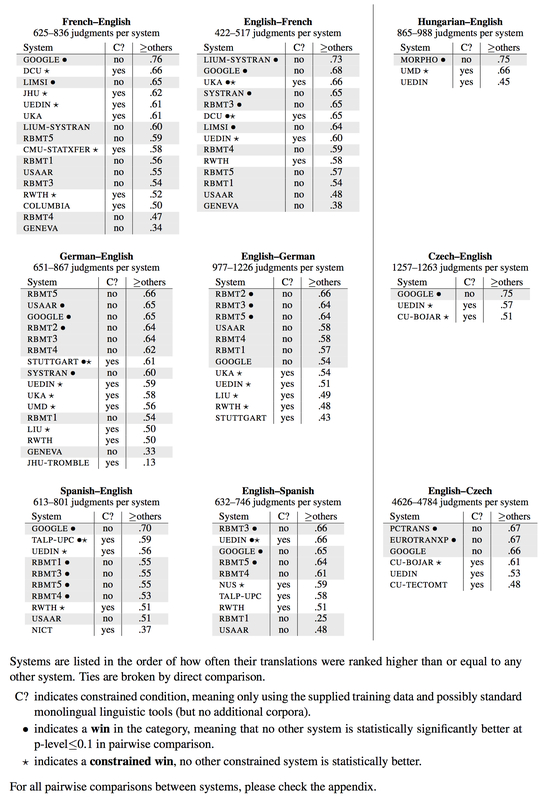 Figure 7: The decoder for the baseline system has translation options only for those words which have phrases that occur in the phrase table. In this case there are no translations for the source word votare ́. Abstract: Previous work has used monolingual parallel corpora to extract and generate paraphrases. We show that this task can be done using bilingual parallel corpora, a much more commonly available resource. Using alignment techniques from phrase-based statistical machine translation, we show how paraphrases in one language can be identified using a phrase in another language as a pivot. We define a paraphrase probability that allows paraphrases extracted from a bilingual parallel corpus to be ranked using translation probabilities, and show how it can be refined to take contextual information into account. We evaluate our paraphrase extraction and ranking methods using a set of manual word alignments, and contrast the quality with paraphrases extracted from automatic alignments.